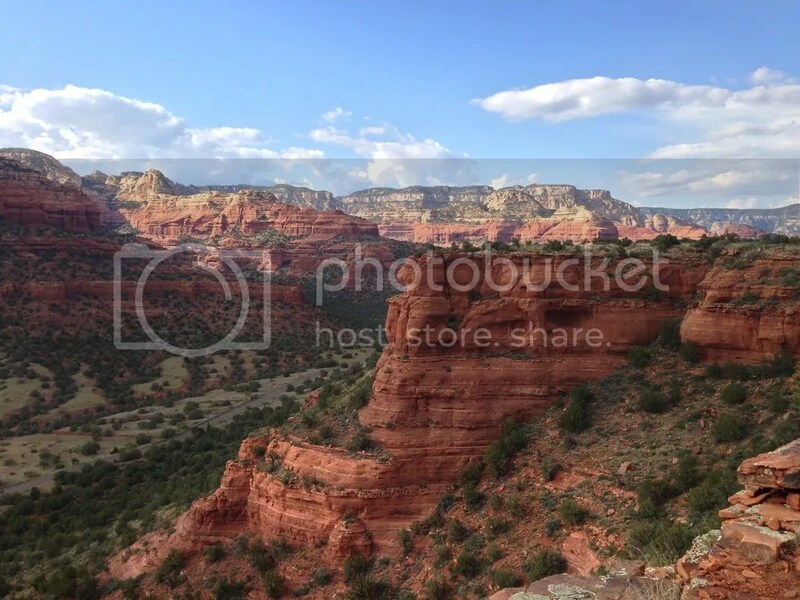 My friend Caroline and I had only a little time left in Sedona Arizona before we had to head back to Los Angeles. 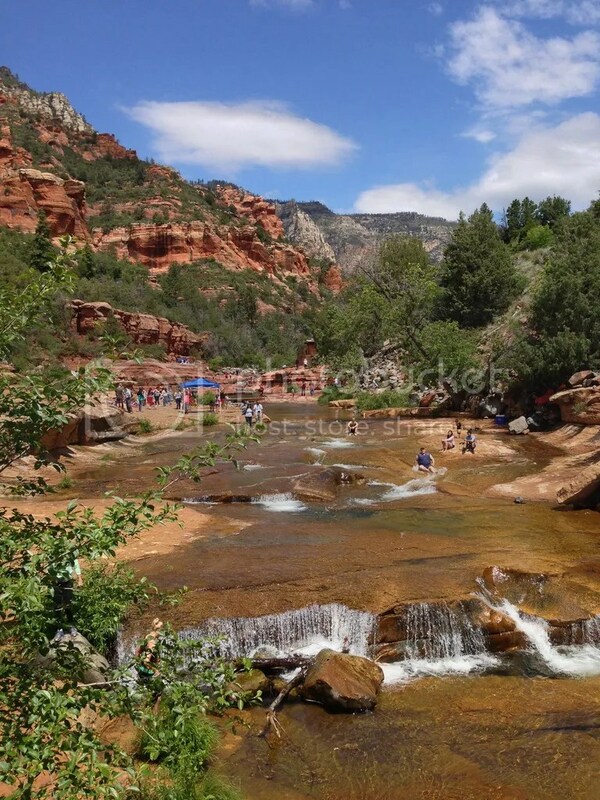 We wanted to do a hike so I picked out one from my book, Sedona’s Top 10 Hikes by Dennis Andres, I got from the Oak Creek Visitor Center. Doe Mountain Trail was it’s name and it was said to have some of the best views of all the hikes nearby. 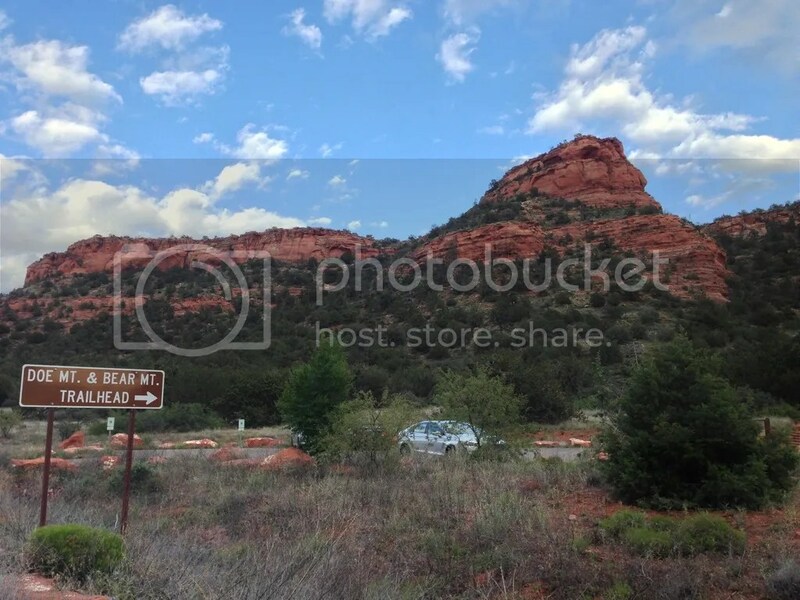 We headed through Sedona on 89A and took a right at a light onto Dry Creek Road, heading north. We reached a T and turned left onto Boynton Road and followed that until we hit another T taking another left onto Boynton Pass Road. The trail was down the road on the left, right off a big parking lot at the base of the mountain. If you reach Aerie Road you have gone too far. As we arrived at the base of the trail and looked up to the mountain top Caroline and I caught ourselves thinking, ‘We’re going to hike all the way up there in just under a mile? This is gonna be tough.’ But the book informed us that the hike and trail would be moderate difficulty with many switchbacks making the journey a gradual climb up the mountain side. 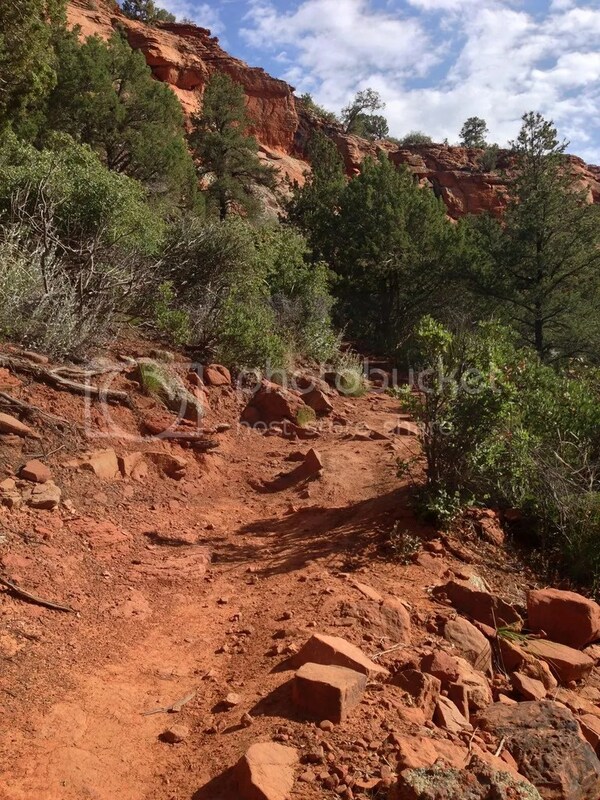 It stated that we would barely notice that we were going up at all with the trail being so gentle and it would be easy to lose our focus. As we started our journey we saw two older folks that looked like they hiked often on their way back down the mountain and felt a sigh of relief. ‘If they can do it surely we can do it,’ we thought to ourselves. 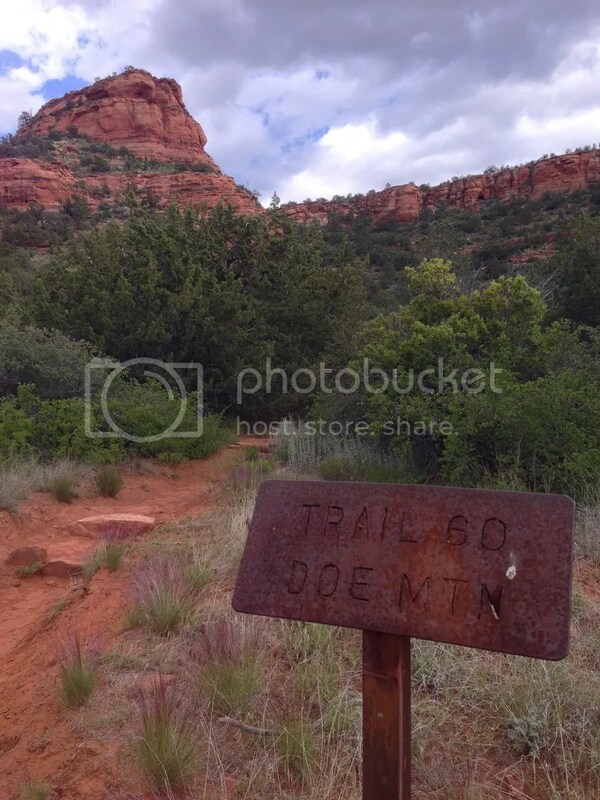 We headed down the trail, past some trail markers and the sign in book, which we opted not to sign. Before we knew it we were at the base of the mountain and as we looked back toward the car, we were already up above it in the parking lot below. 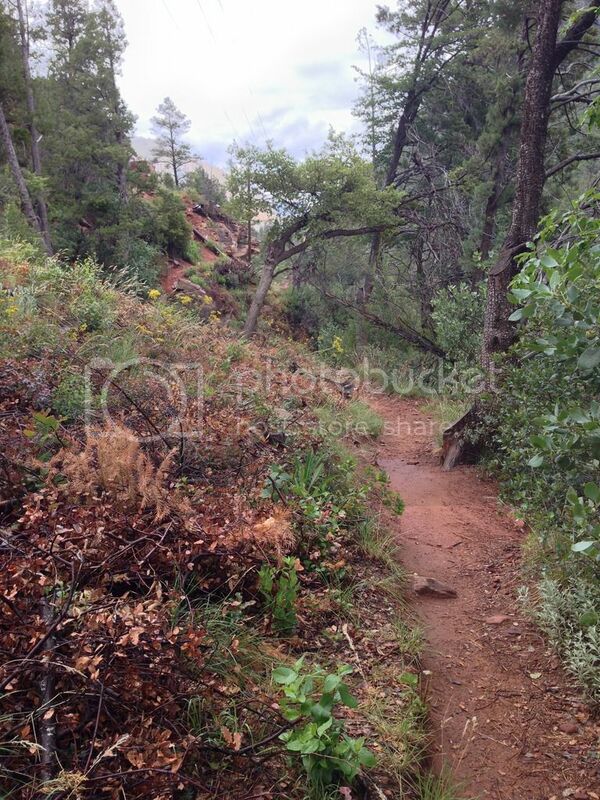 We began our climb up the mountain and the dirt path narrowed as we reached the switchbacks. We curved around bends and climbed over rocks back and forth, each level leading to a longer distance of walking before reaching the next turn. The dirt was dark red and trees were perfectly green making for a beautiful contrast of colors. We gained elevation pretty quickly and each time we stopped to look at the view there was a drastic difference as we got higher and higher. Trail was a little tricky and I stumbled a few times as my focus was on the scenery around me not what was under my feet. 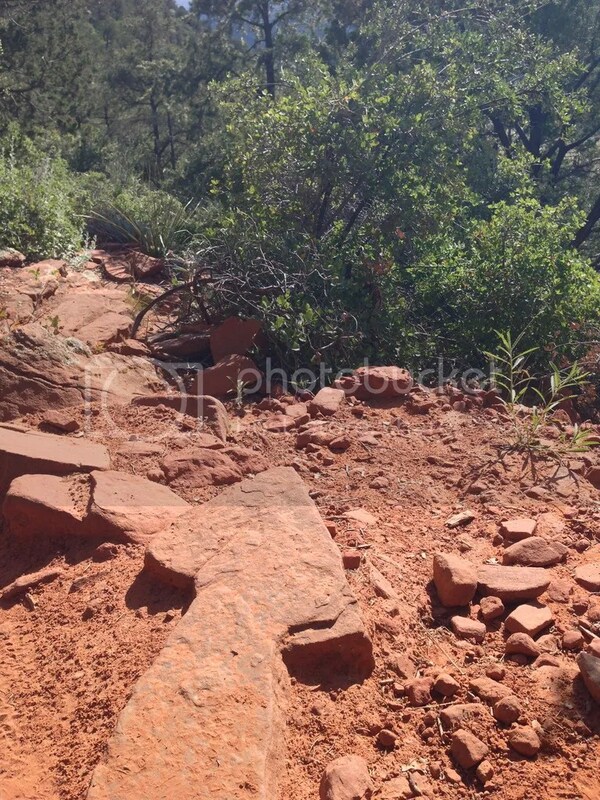 I tried to stay alert for the occasional rock, stump, and super narrow spots where you have to climb up the rocks or up some stairs without falling down the side of the mountain. The last thing I wanted to end my trip with was with a long tumble down to the bottom of the mountain. We reached just below the top of the mountain and noticed an arrow pointing the way back down. Just past this was the last climb up through a narrow chute bringing us to the top. We stopped for a moment to take in the view of where we had come from. It was beautiful. We also took a moment to take one last look at our remaining route up. Cacti scattered the edge of the mountain ridge and gave an interesting and drastic look that you can’t see anywhere else. As we came out of the chute I made a mental note of where it was so that we could find our way back. We started to head across the flat top of the mountain. At this point the trail becomes lost with only a few old markers left to guide you. Some have arrows, some do not, but luckily you can usually see the next one from the one before. After a short jaunt we came to the other side where it was even more beautiful than where we came from. Words cannot even describe it. 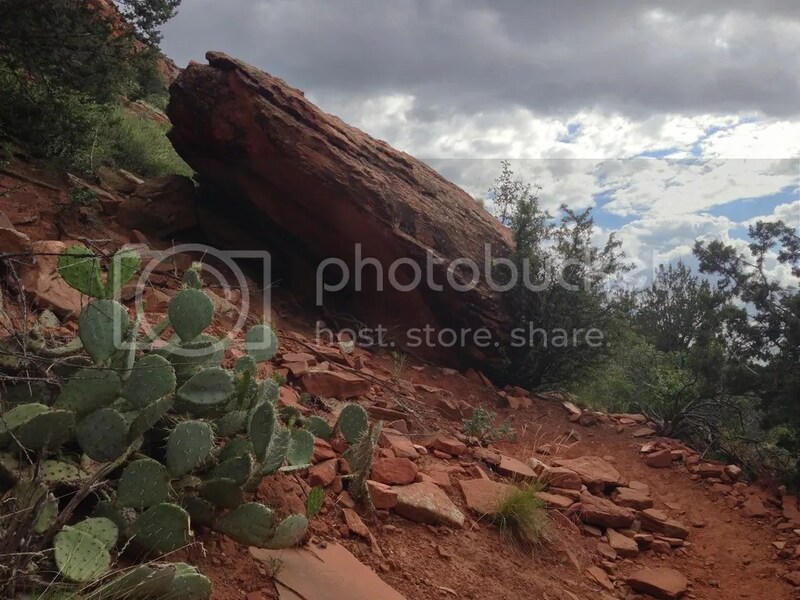 Instead of heading toward the east, like the book suggested my friend and I opted to take the walk through the different cacti, trees, and over uneven rocks to see if we could reach the other end of the mountain. We passed more amazing views and crossed over and coyote poo and tracks. We made it pretty far on our own trail, sticking close to the edge not to lose our way. 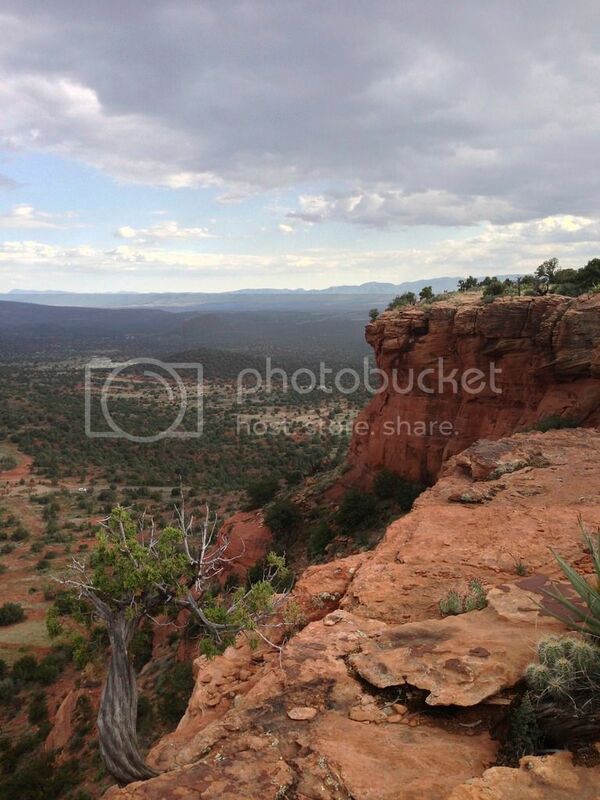 We eventually came to one last overlook that we felt was worthy of our final pictures. 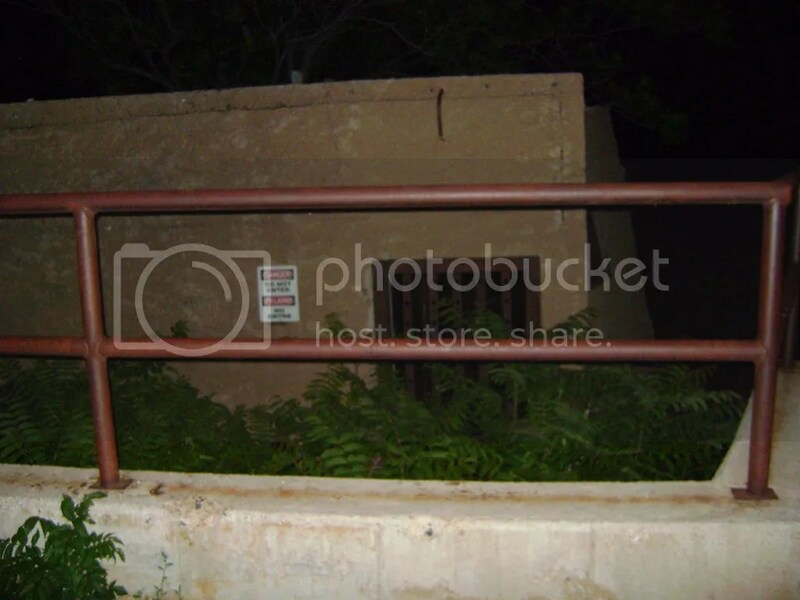 It was getting late and we still had to climb down and drive all the way home so we decided to head back. We found the chute we came up and climbed down it. It’s really the only way up or down that’s safe and won’t leave you on the wrong side of the mountain or stranded half way down the side of the mountain according to the book. The trek down the mountain gave us a slightly different view, but it was just as magnificent. 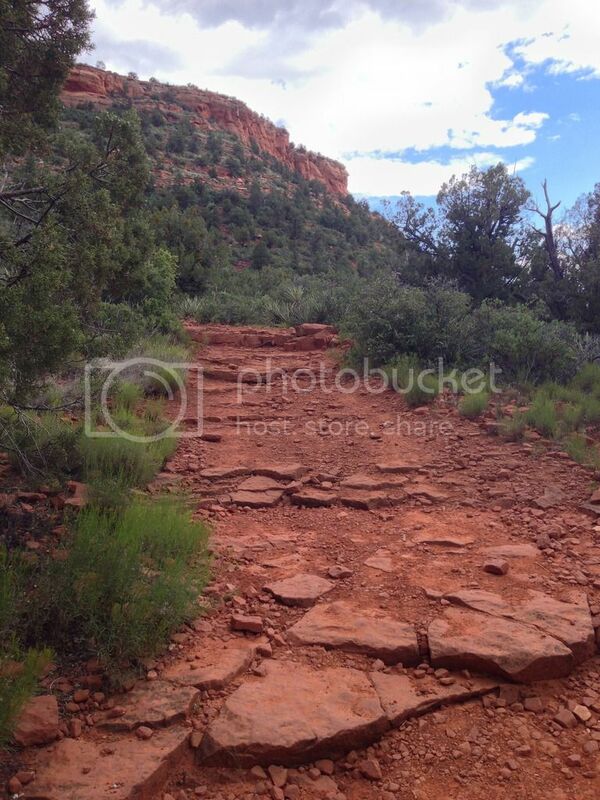 Doe Mesa Trail is absolutely gorgeous. I’ve never seen views anything like it anywhere else. As I continue my travels, I hope to find many places just as beautiful if not more beautiful than it. 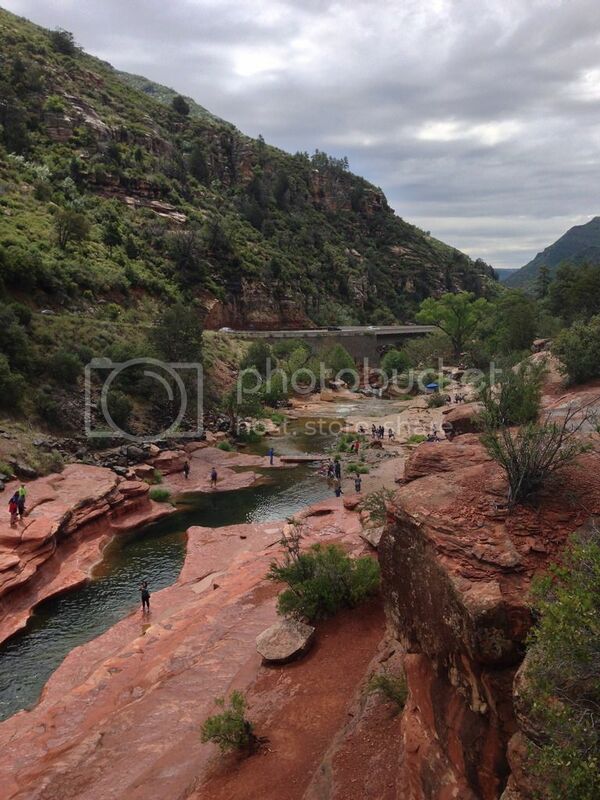 Even though it rained on and off during our hike I will never forget it. 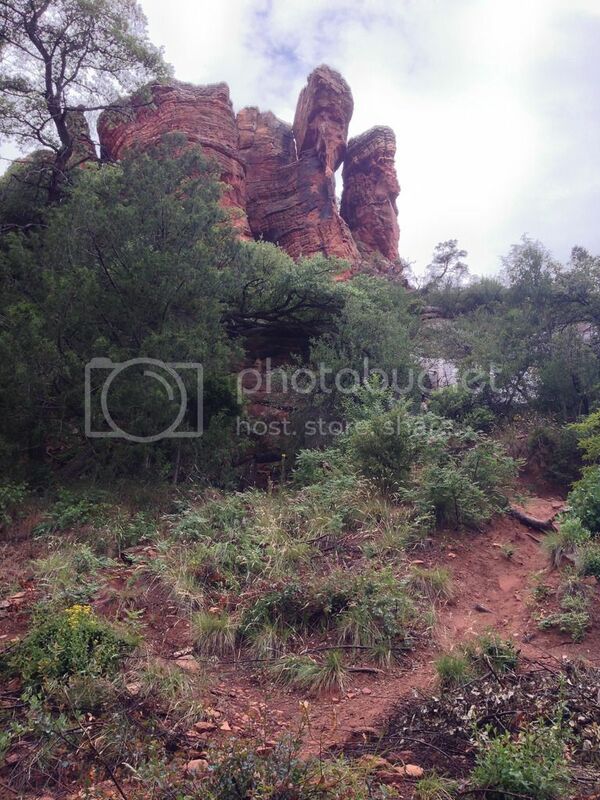 It’s one of those hikes that I will be sure to do again next time I am in Sedona and I hope that you will get to try it too. 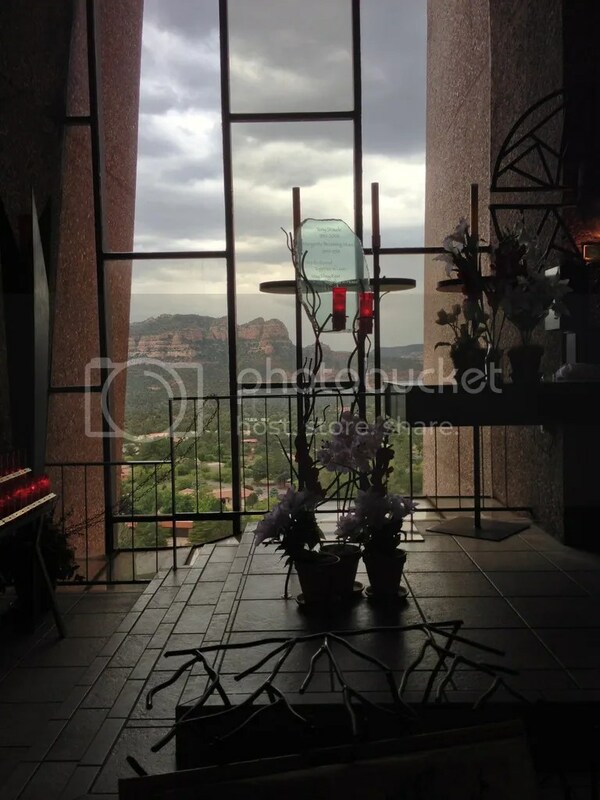 My friend and I stumbled into Holy Cross Chapel, a Roman Catholic chapel, while we were in Sedona Arizona. The chapel was built into the the rocks and run by the Diocese of Phoenix, as a part of St. John Vianney Parish. It took Fred Courkos’ crew 18 months to build, costing $300,000, and was completed in 1956. We weren’t originally planning on checking it out, but as we got closer to Chapel Road and since we didn’t have much free time left we made a last minute decision to squeezed it in and go see what it was all about. We took the left off 179 and headed out to the end of Chapel Road where Holy Cross Chapel is located. 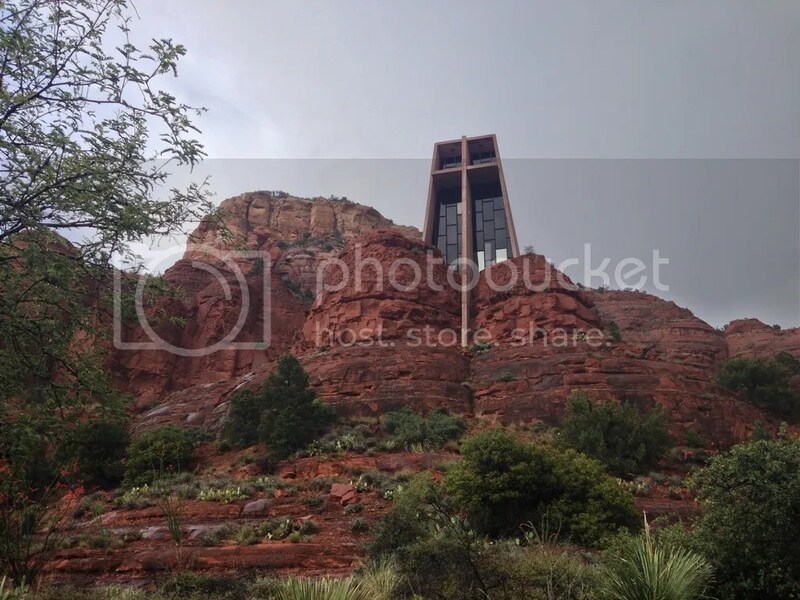 As we got to the chapel, we passed it on the lower road. Next thing we knew we were stuck in traffic. Since I was excited that we decided to see the chapel my friend suggested that I jumped out of the car and walk up the road to see what was going on. As I came around a bend and to the beginning of the parking area I realized that there was traffic because there were employees helping people park. The line of cars wasn’t that long so I decided to walk a little further up the road to the top and check out the view from the chapel. 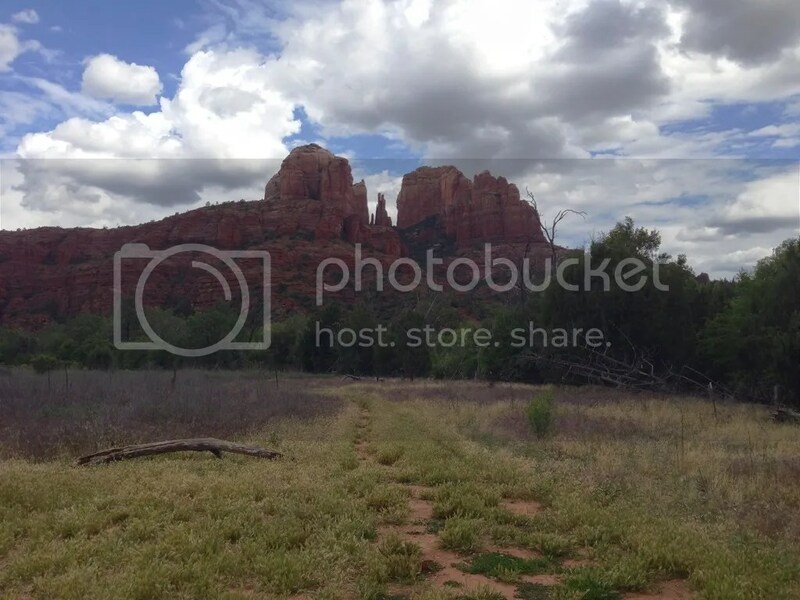 By the time I got to the top and took a few pictures of Bell Rock and several other rocks I could see that my friend was only 1 car away from parking. 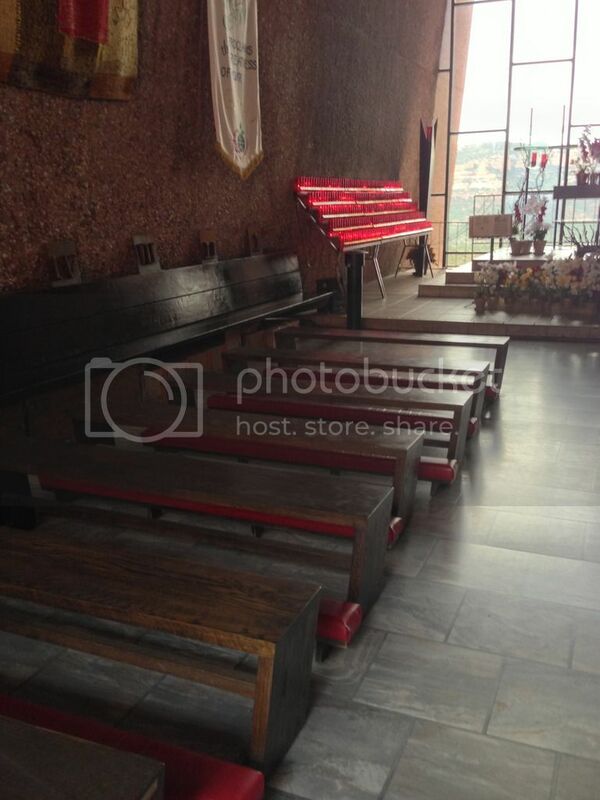 I took a peek inside the chapel and then headed back down to my friend. The skies that had been super clear on my way up the hill suddenly got extremely dark and it started to rain. 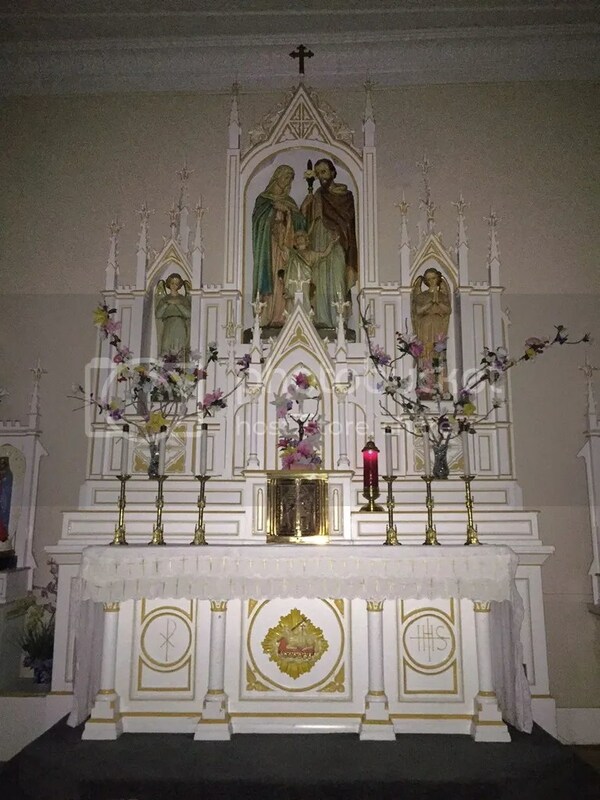 I met up with my friend and we ran back up in the rain and straight into the chapel which was quite small, but very beautiful. 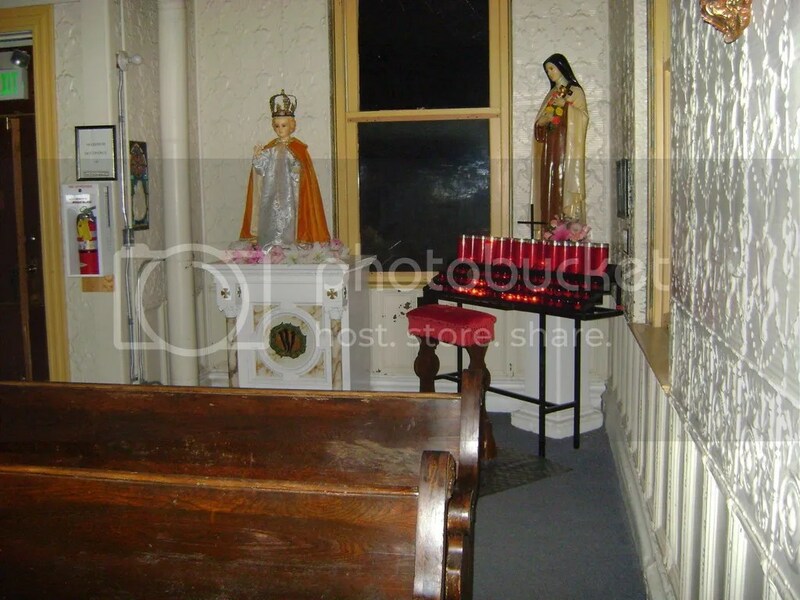 It was full of people trying to escape the rain sitting in the two rows of pews and along the edge of the building. 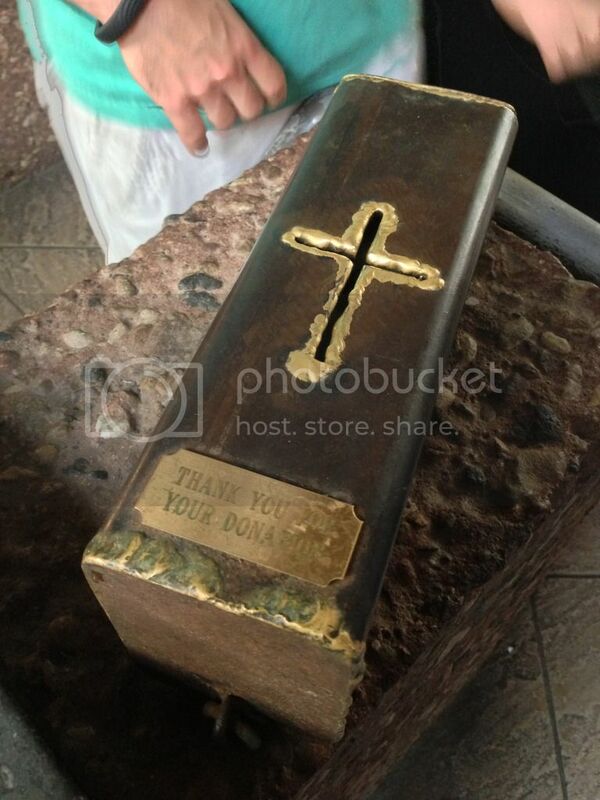 Inside there were also two long rows of candles, a memorial plack, a donation box, and a gift shop below. We took a moment to explore the room and then headed to see if we wanted anything from the gift shop. We walked around looking at merchandise, most of which had a spiritual concept or connection. We also found a small wall which had a bit of history on it including a picture of what site prior to the chapel being built on it looked like in 1955 and after the chapel had been built in 1956. My friend purchased a small item and while she was doing that I overheard someone ask if there were still services held in the chapel. The employee responded by telling them that services are held elsewhere in another chapel not too far away. Later in my research on their website it says services are held, but only on Mondays at 5pm. I wondered which is true. We headed back up into the chapel. It was still raining, but we decided to move onto our next adventure anyway. As we drove down I got a few more pictures of the front of the chapel. 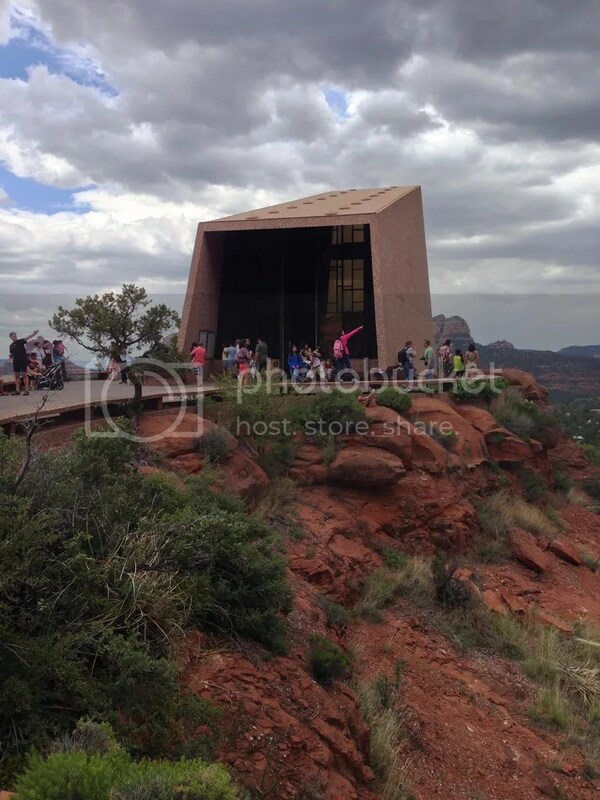 If you are in the area and have a little bit of time this chapel is perfect for a quick stop. It’s small and magnificent all at the same time. 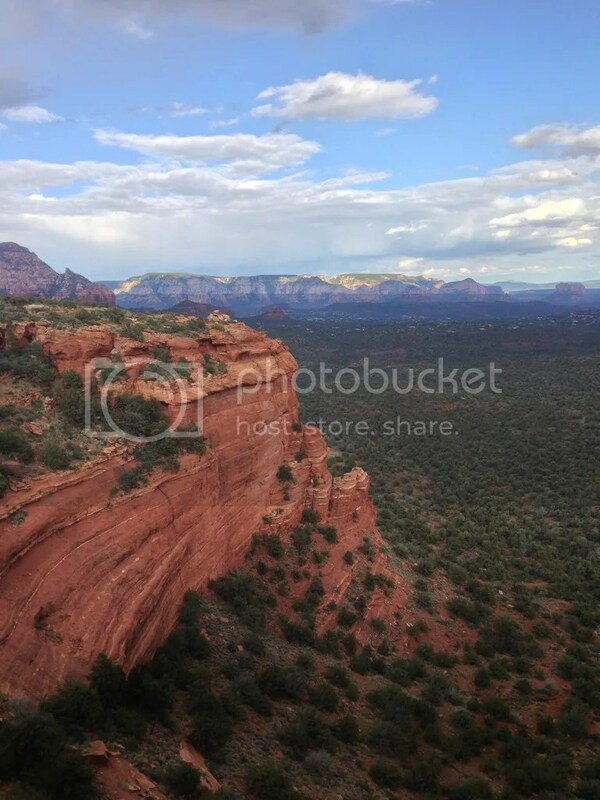 On my friend and my second day in Sedona Arizona we woke up early so that we could spend the morning at Slide Rock State Park. 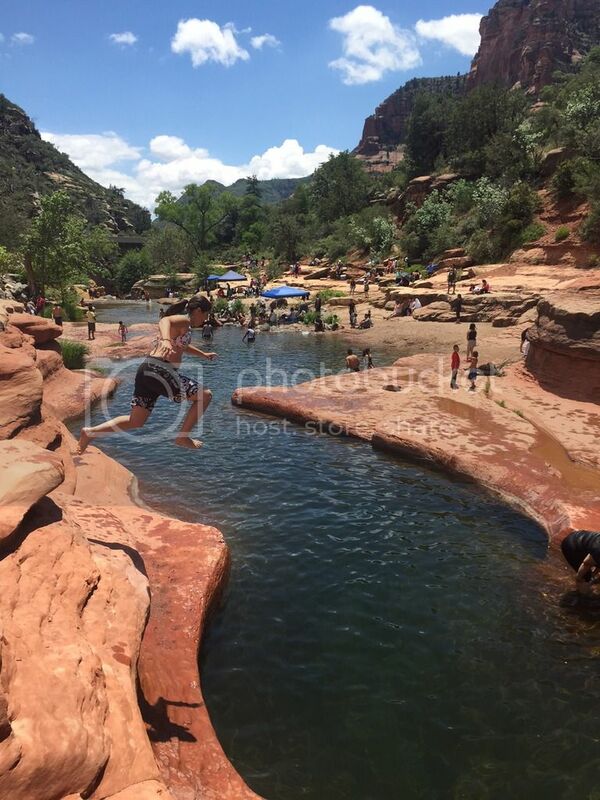 We were super excited to jump from rocks and ride nature made water slides. We hoped to get there early and miss the crowd that we had noticed the day before. It was a 45 minute wait to get into the park when we passed that day. We got there so early that there was no wait at all. We pulled into the park and paid our $30, more than usual due to the fact that we went on Memorial Day weekend. It was even raining, but we wouldn’t let that stop us from having fun. We decided to take some time to explore the area before heading down to the area where people swim, jump from rocks, and ride the slides. We took our time walking out to the rock slide area and found some old tourist cabins built in 1933, the Pendley homestead house built in 1927, the Rock Slide Market which was closed that morning, a black apple orchard, a bunch of old farming equipment, and the apple packing shed built in 1932. In 1907, on a fishing trip to the area Frank Pendley decided to try to claim rights to the land. 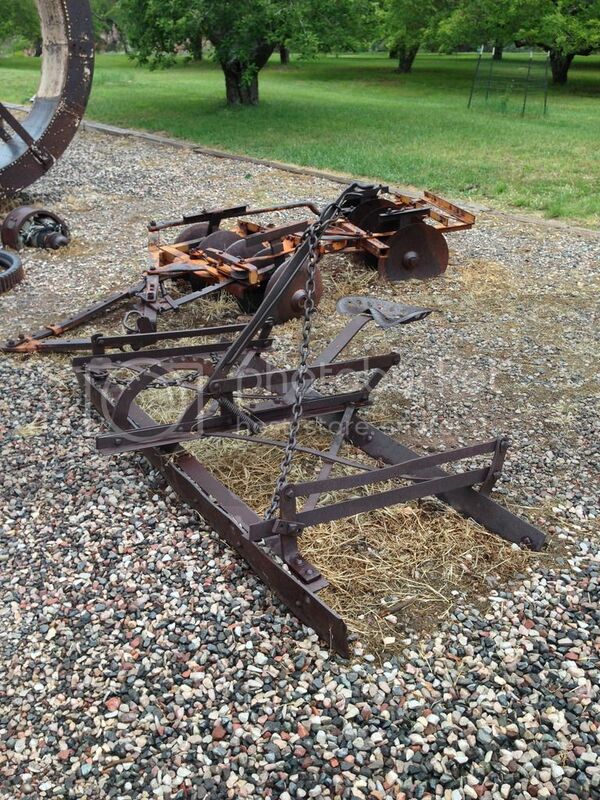 It had been unclaimed due to the difficulty in diverting the water from the creek in the area. By 1910 Pendley was able to established squatter rights to the area as he had figured out a way to build an irrigation ditch. 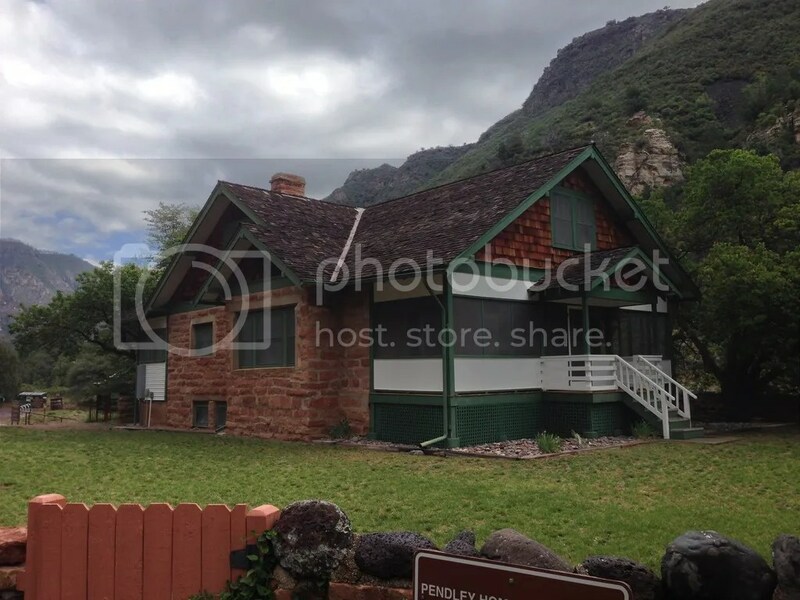 He built a cabin on the land as well and filed for ownership under the Homestead Act. The original cabin was torn down in 1927 and replaced by a new homestead with running water that you see there today. The homestead and farm gained electricity in 1948 and a telephone in 1950. 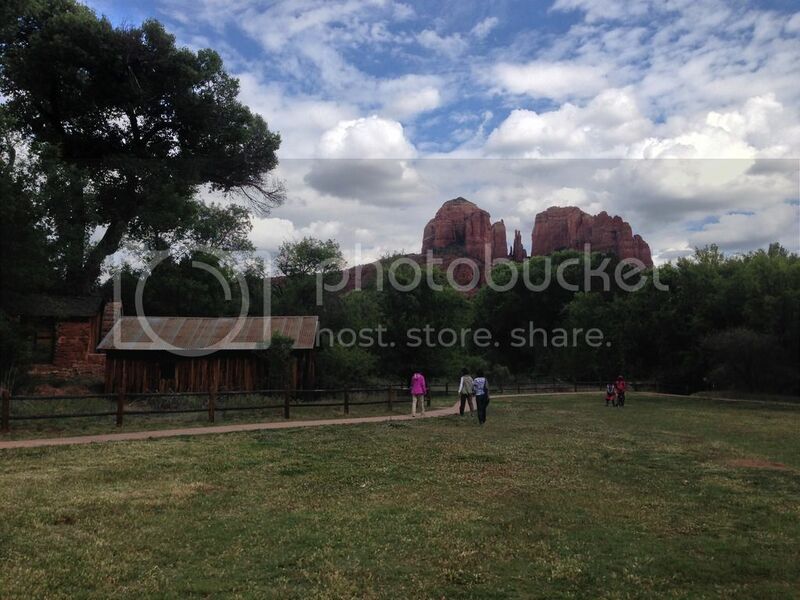 In 1984 the farm closed and was sold only a year later to the Arizona Parkland Foundation. The State of Arizona then purchased the farm. 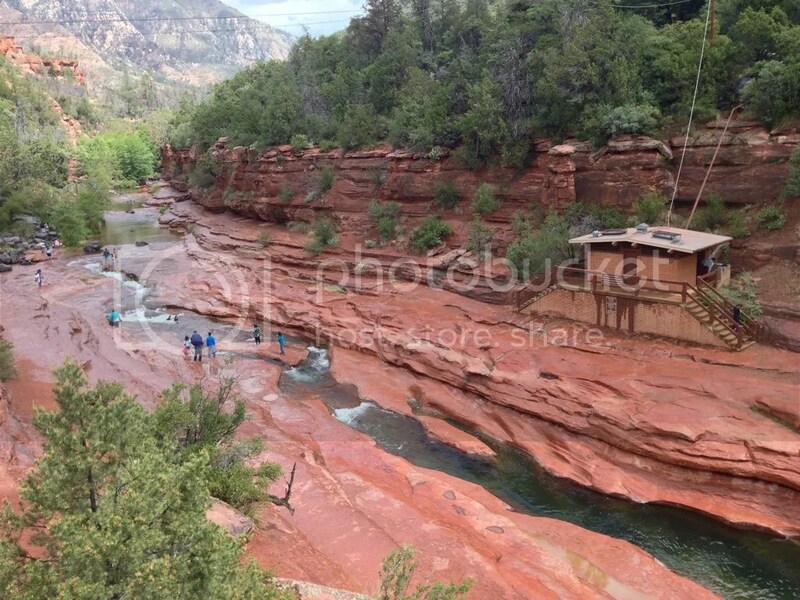 In 1987 it was opened to the public as Slide Rock State Park. It didn’t take long for us to explore all the history and reach the slide area. It was still quite early, rainy, and pretty cold out when we did and we were nowhere near ready to get in the water. 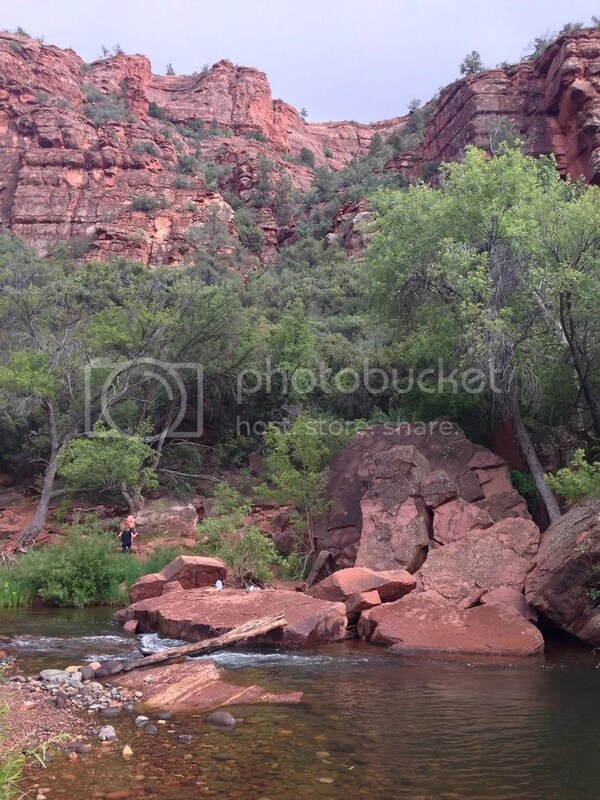 We walked a little further past the apple packing shed and found a hike that ran above the creek overlooking the main attraction to the park, the rock slides. 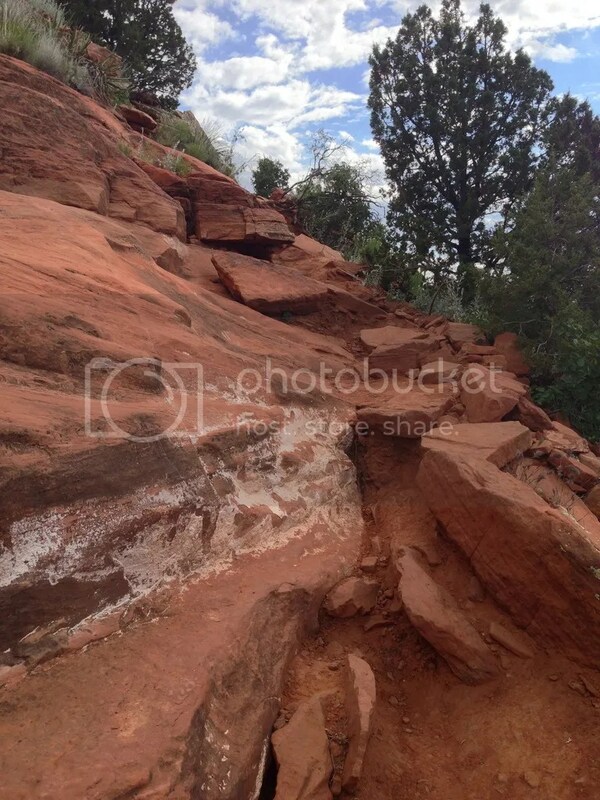 It was called Cliff Top Trail. 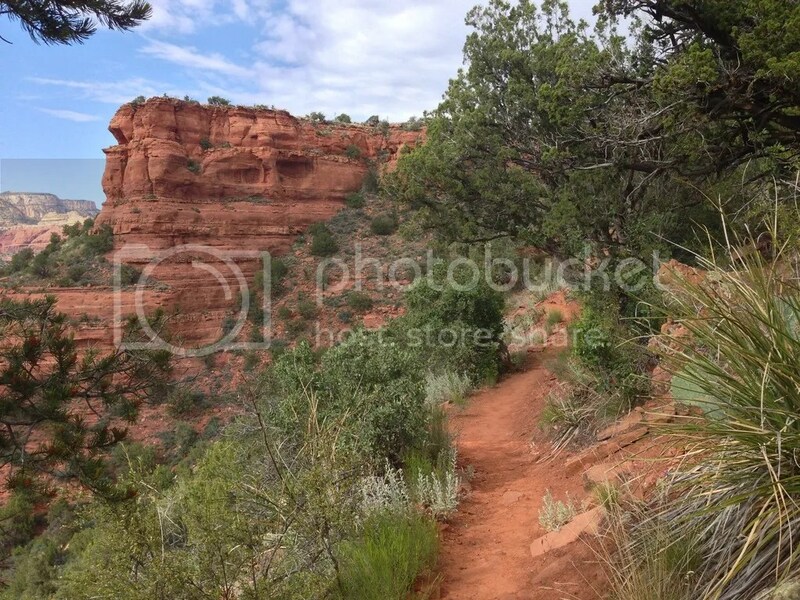 The trail was a dirt path that was not that long, but gave the most beautiful views of the park. 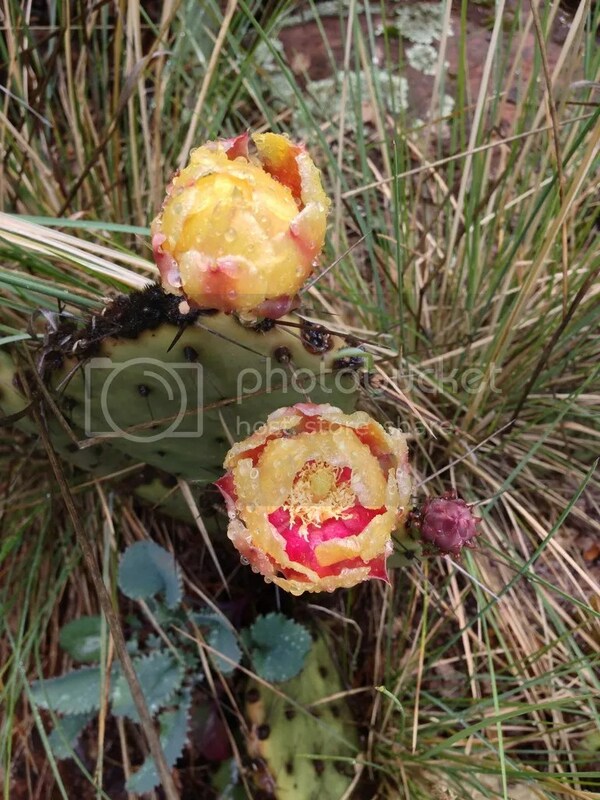 We also found cactus flowers, a small orchard, and several cliff overlooks. As we walked we reached a point where the path started to become steep and very narrow. We decided to turn back due to the rain which had made the rocks super slippery. As we headed back the rain started to clear up. 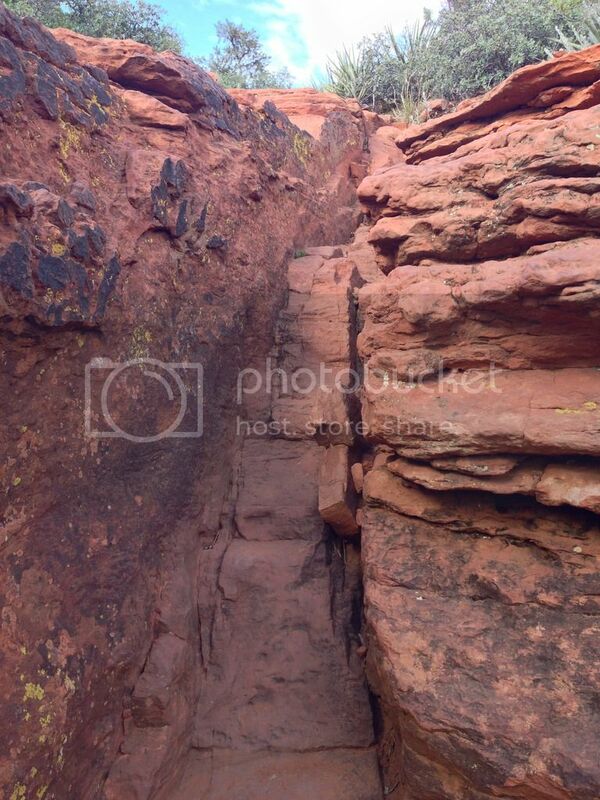 We headed down into the rock slide area and explored a bit more. First to the south to see the underside of the bridge and where cliff divers jump into the cold water below. Then to the north to scout out our own jumps and rides through the park. It was absolutely beautiful. It started to get hot and we couldn’t take it anymore. We headed back to the car to get changed and set to have some ultimate water fun. 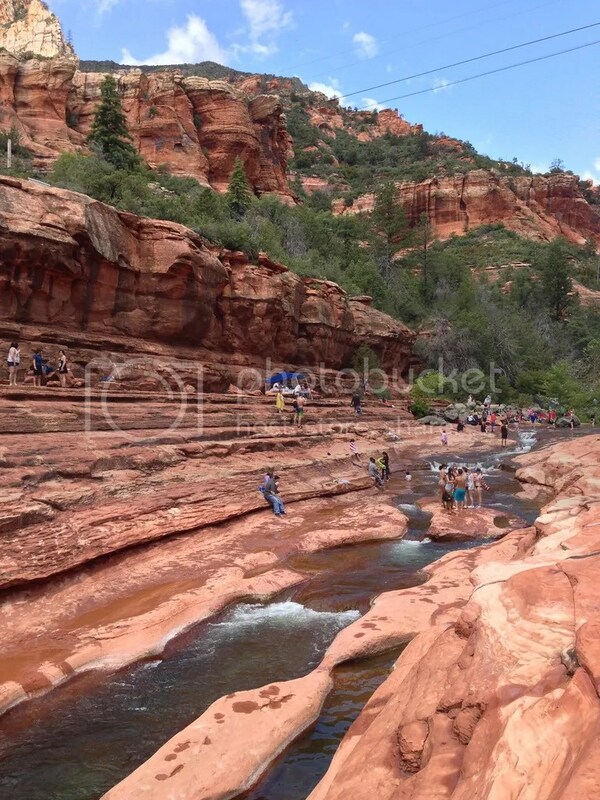 Cliff jumps were first on our list so we lined up behind some boys and waited our turn. Then, we jumped in. 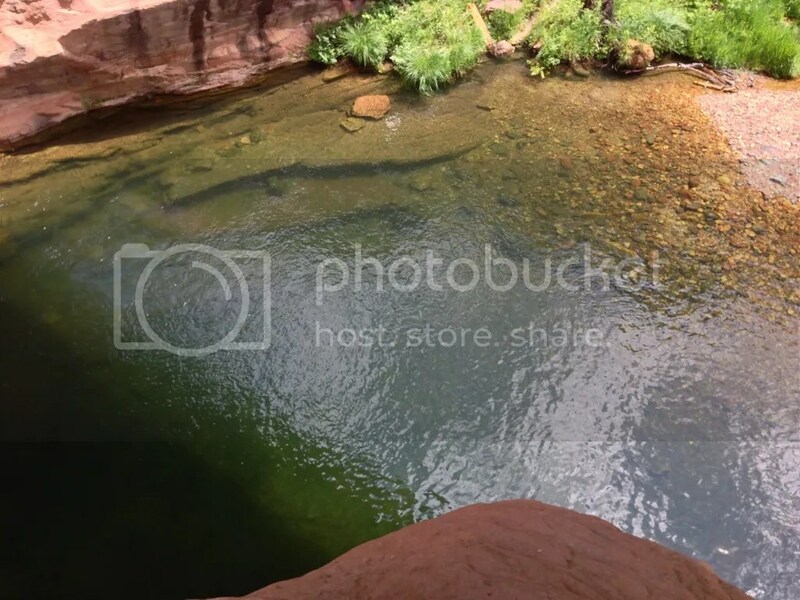 The water was so cold it was a shock to your body which made climbing up the rocks on the opposite side to get out more difficult than it needed to be. By the third jump you fall into a rhythm and know exactly how and where to place your legs to help you get out. Next on our list was the rock slide. Once again we lined up behind some children and waited our turn. They were having so much fun, sometimes stopping and allowing the others to crash into them. We waited for them to clear out and then rode down the slide. The water pushed you so hard you barely had to do anything to help yourself along. Occasionally a little guidance through a longer stretch, but that was it. It was so much fun. Up and down and sometimes almost turning around. We went twice and then the water started to feel too cold to continue to stay in. 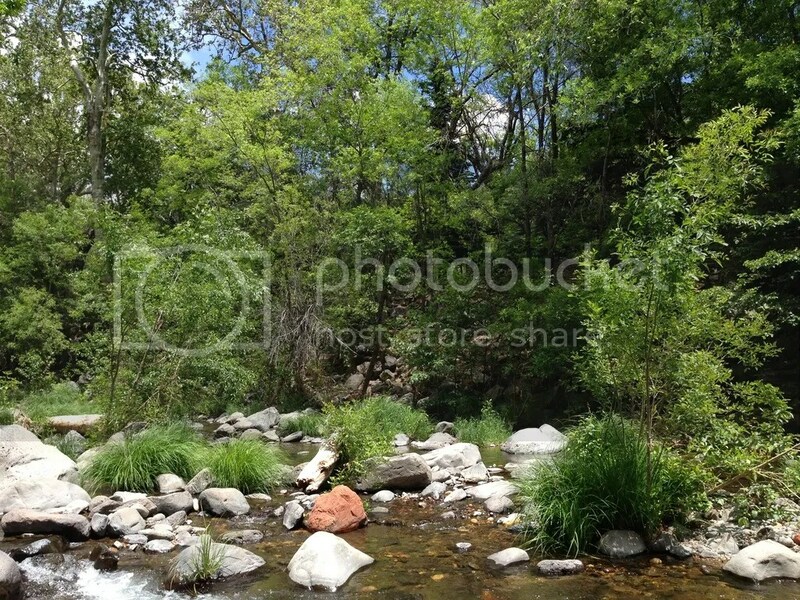 Rock Slide State Park is a great place to enjoy a nice sunny summer day. 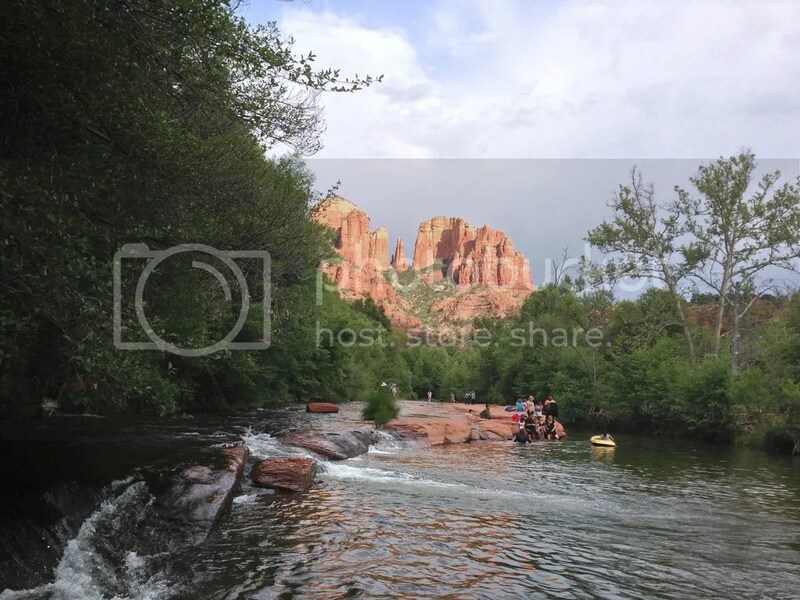 The history, the trail, and the water park are all in unity with an amazingly spectacular outdoor outing. 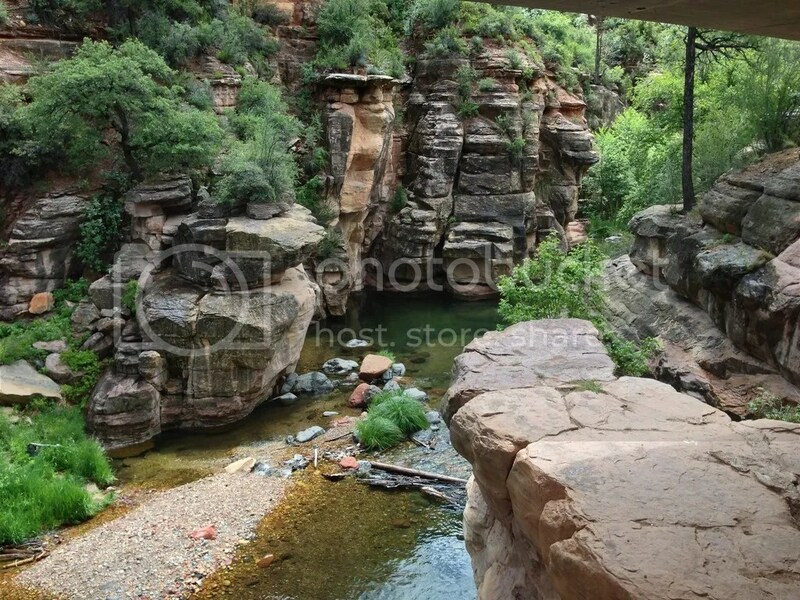 Go spend the morning there sliding and jumping down the rocks, then have a picnic at one of their many tables and end then afternoon with more water shenanigans. Children and adults, who are like big kids, will be entertained and will love coming back to this place time and time again. I know I did. And I will be sure to go back soon. On my friend and my trip to Sedona Arizona we spent an evening in the Ghost Town of Jerome enjoying a Haunted Ghost Tour. While we were waiting for our tour to start we had just enough time to explore the little town and grab some dinner. We walked up one of the main streets and noticed the town hall, the mine museum, and visitor center. 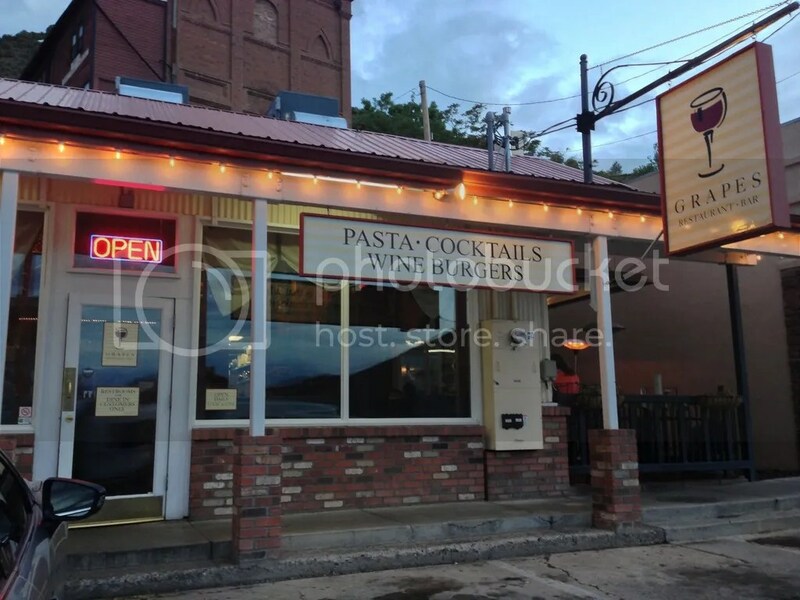 We decided to stop in at Grapes as it was recommended by the tour guides as one of the few restaurants open late in town on a Sunday night. We walked inside and the place was very busy. 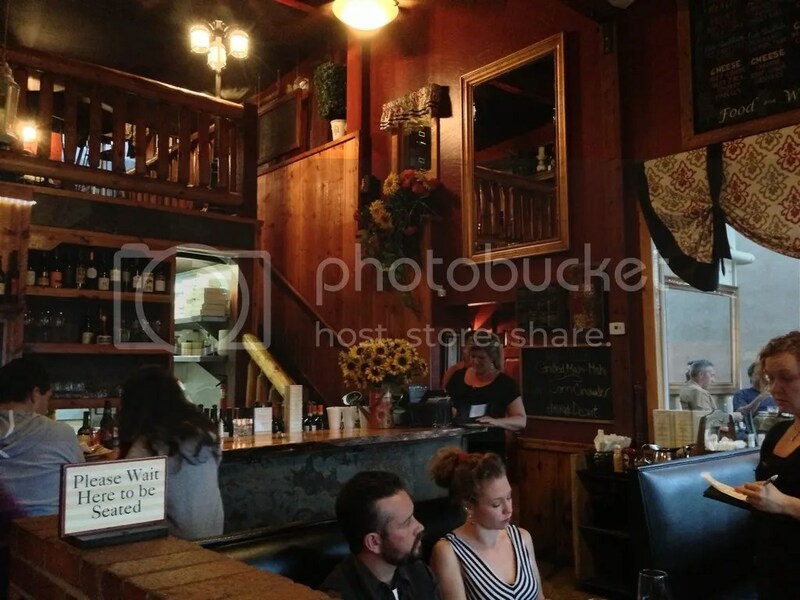 There’s both indoor and outdoor seating and inside has a bar-like atmosphere with low lighting, stone and wood walls and interesting pictures hung on the walls. 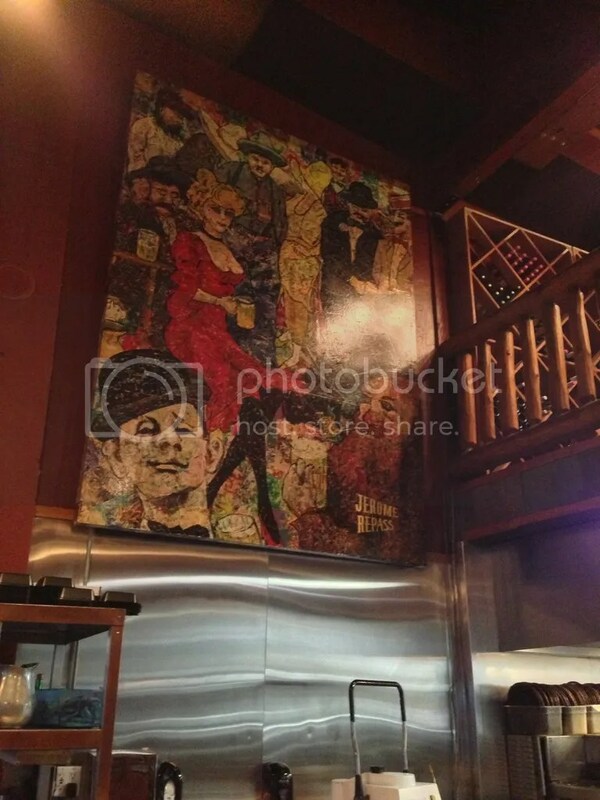 We stepped up to the bar where you could easily see the food being prepared behind it and spoke with one of the servers. She was extremely helpful and nice, especially since we were on a time crunch and there was a sign I saw that said Dine-In Only on my way in. We needed to be sure we could order, eat, and finish our food all in time to be at our tour by 8:00pm so we asked for a little extra help. Our server offered us an option of a few quick meals. 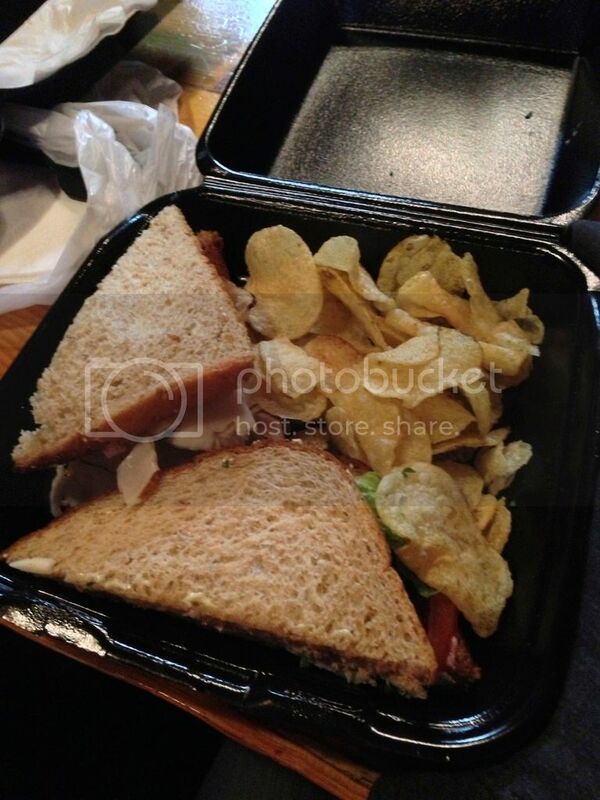 We decided to order some sandwiches, turkey and cranberry sauce, and chips. The food came very quickly and was delicious. We packed our leftovers to go and dropped them off in the car. Then we headed to our tour with a little time to spare. 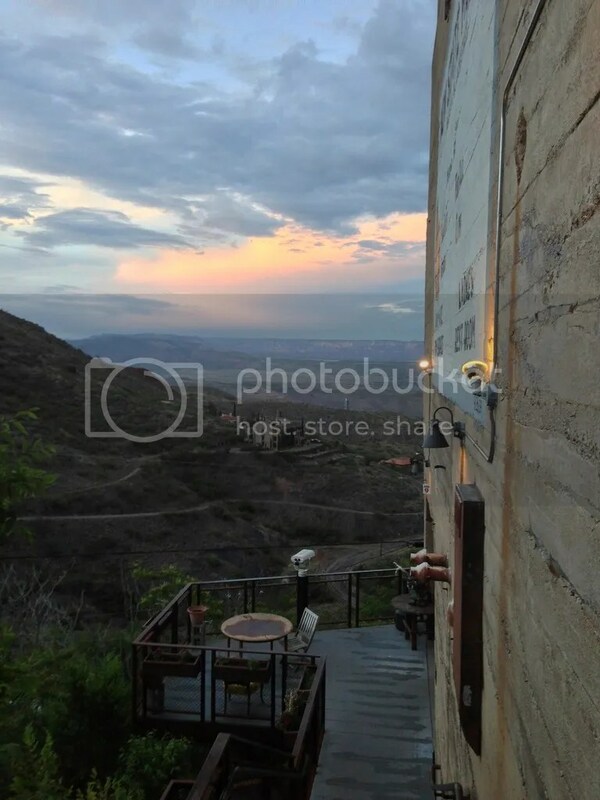 If you’re in Jerome and need a place to eat you should give it a try. 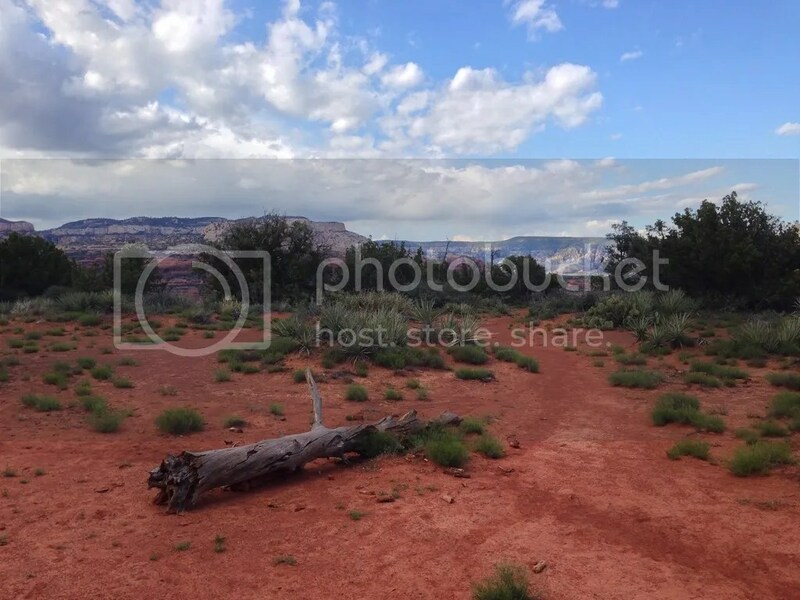 On my trip to Sedona Arizona with my friend I purchased a book of hikes from the Oaks Creek Visitor Center and was eager to try an easy one. 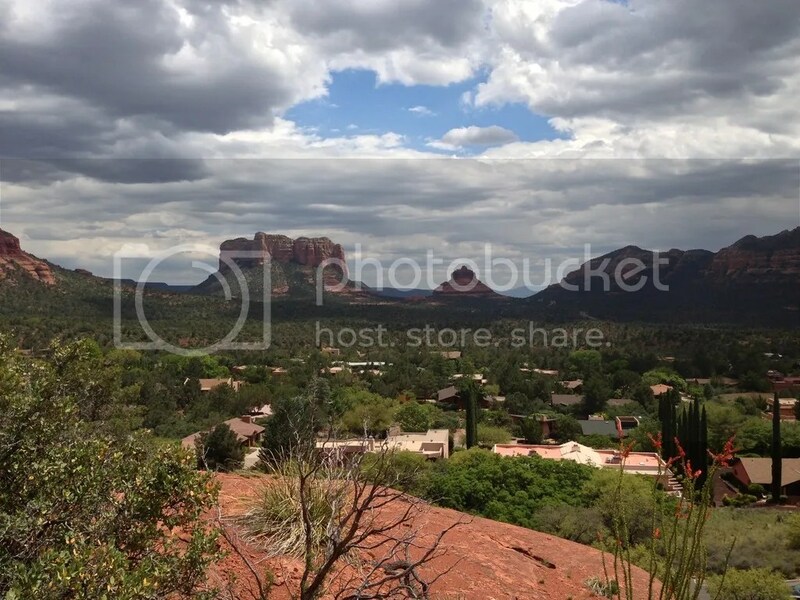 We settled on Red Rock Crossing which is said to have beautiful views of Cathedral Rock. 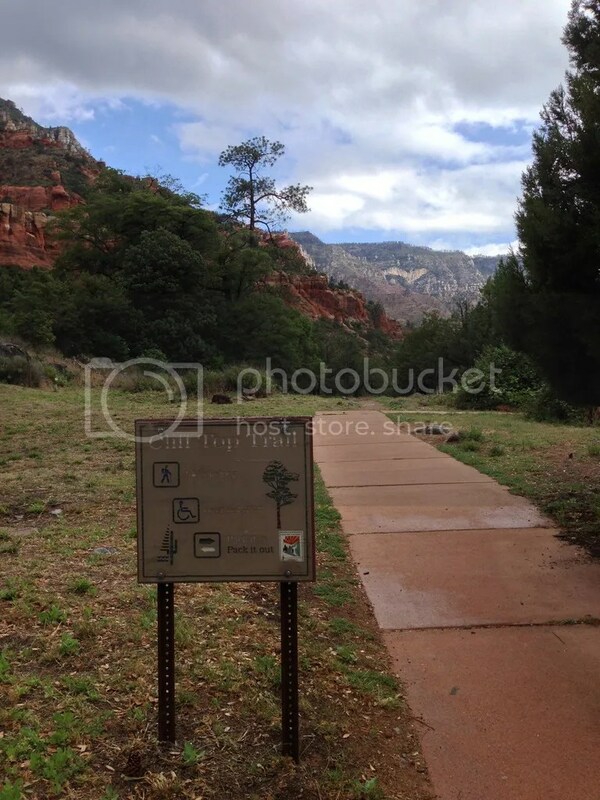 We pulled up to Crescent Moon Ranch of the Coconino National Forest ready to start our hike. Since it was Memorial Day weekend parking in many of the parks was free, but because we got there pretty late in the day the lot was full. Not a great way to start our hike, but we weren’t concerned about it. We were excited to see Cathedral Rock. We found a spot on the side of the road about .5 miles away and walked to the park. It was a little confusing to find the start of the trail since the park did not have proper maps that placed our hike on them, but with the help of the book we eventually found what we thought was the beginning. 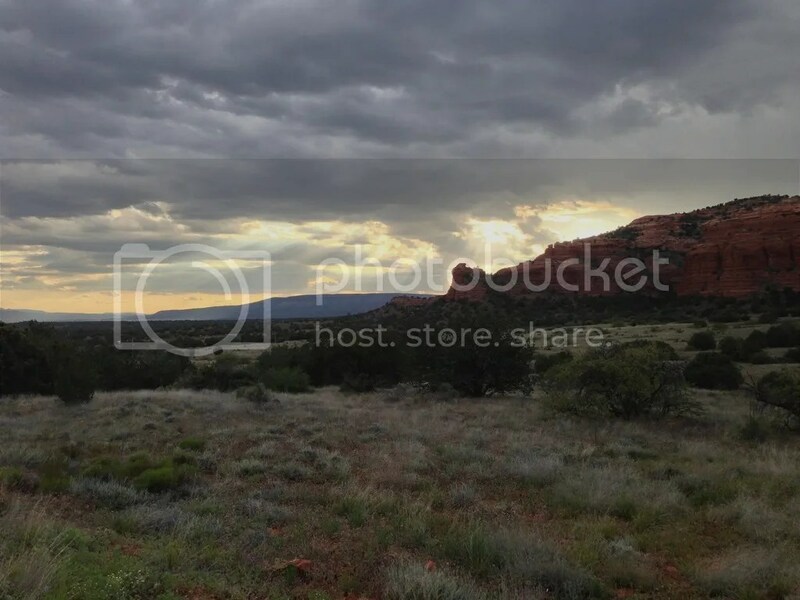 As we headed to the beginning of the trail, far to the back of the park and past the OK ranch and first homestead on this site we stopped for a moment to view the ranch that still stands there today. 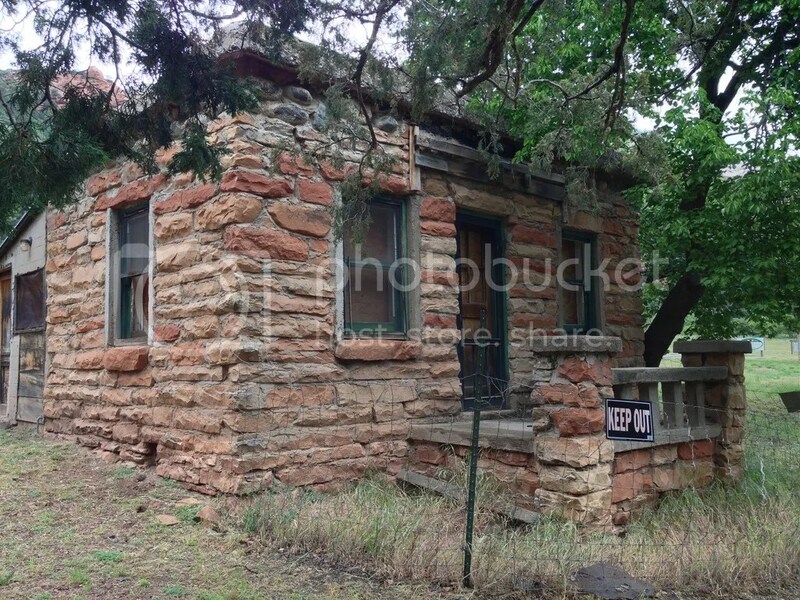 In the late 1800’s Jon Lee dug new channels to bring water to this homestead. 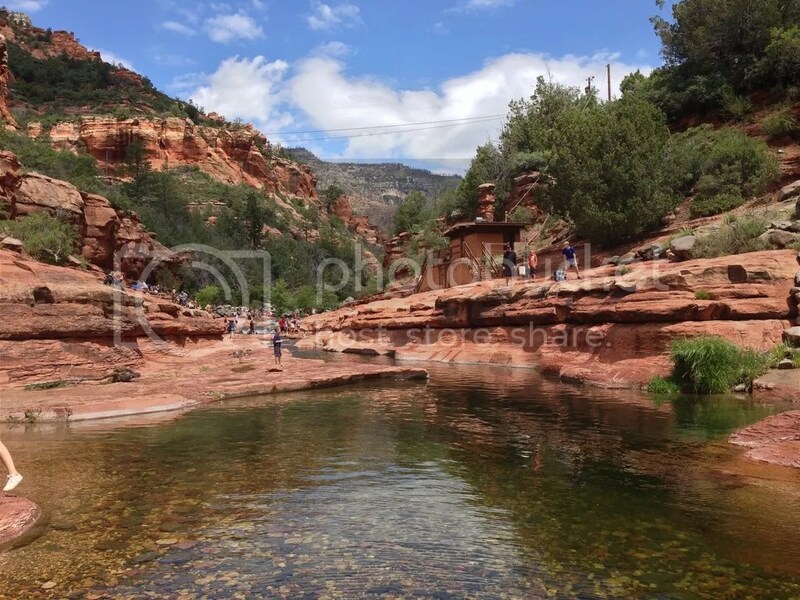 The water was used for irrigation, watering livestock, night baths, and cool drinking water. As the homestead grew and thrived they were able to sustain peaches, apricot, apple, plum and grape orchards in the early 1900’s. 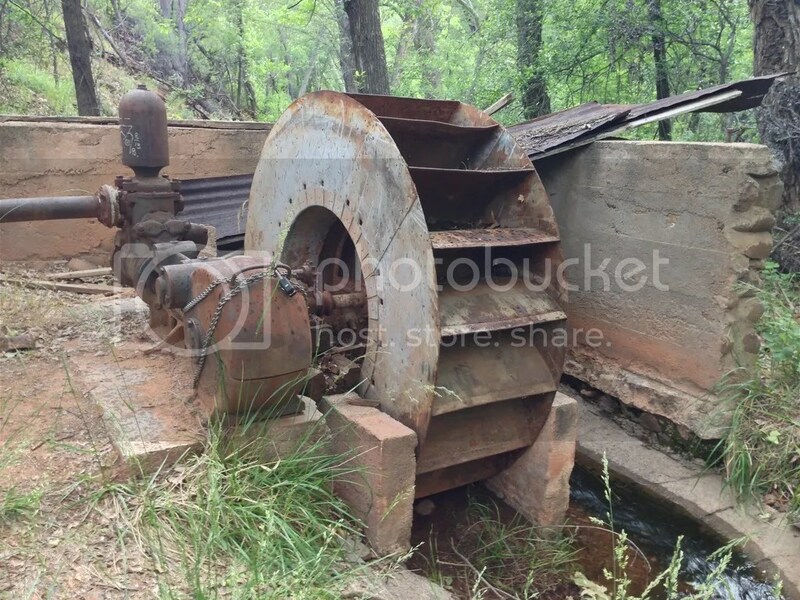 In the 1930’s they ordered a custom built water wheel that can still be seen today. 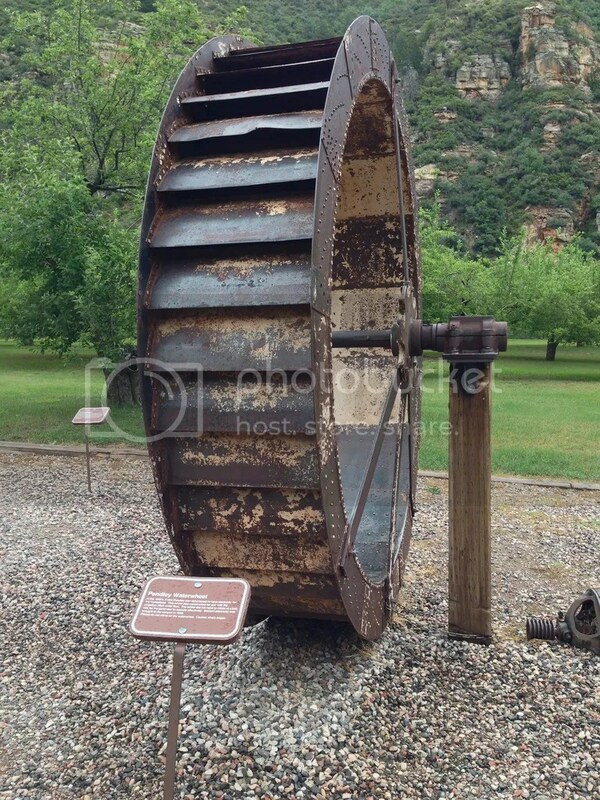 With this wheel they were able to pump enough water to fill storage tanks and provide electricity to the ranch. 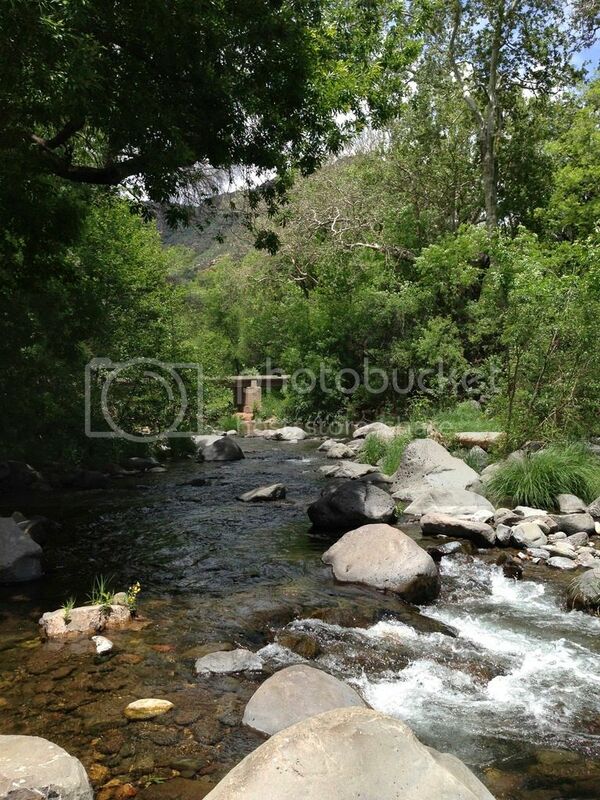 We reached the beginning of the dirt path that runs along Oak Creek and started to follow it. We stayed to the south path, but if you can figure out how to cross the creek without getting wet there is also a north path to explore. I believe there are a few main places to cross. 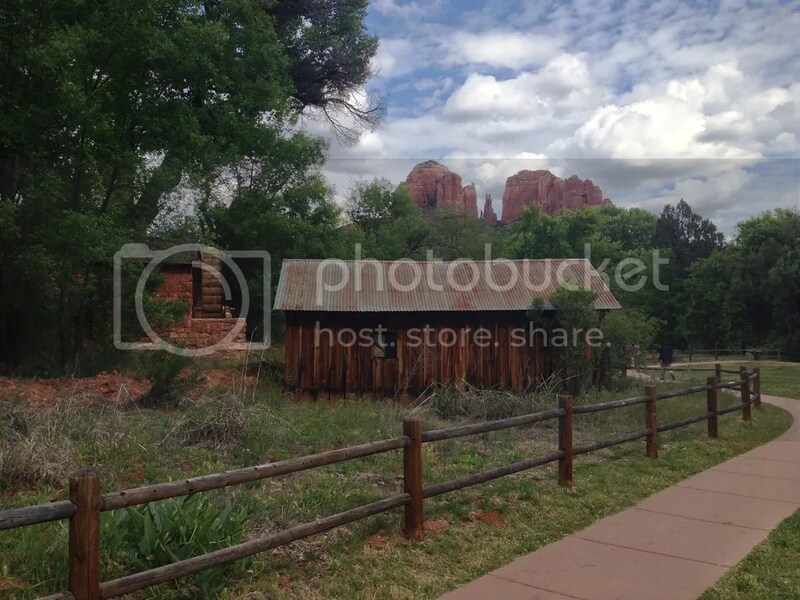 One is at the very beginning, instead of walking toward Cathedral Rock walk away from it. There’s a small dam-like rock path that you might be able to cross over that we didn’t find until we were leaving. Another is farther down with three branches over a fast section of water, but looked super slippery while we were there. Other hikers also say that there were places to cross further down than that, but my friend and I didn’t find any of them. 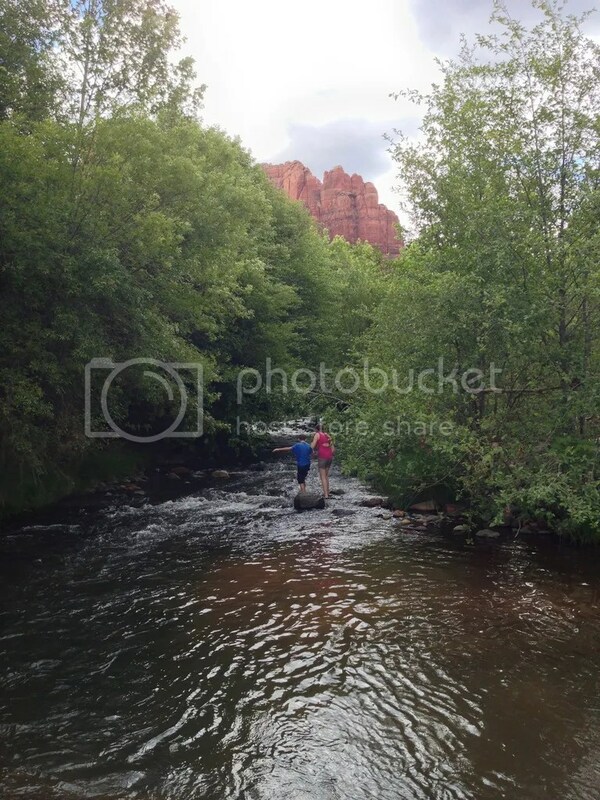 My friend and I stuck to the south path which was beautifully covered by trees with little openings to the creek that allow for amazing picture opportunities of Cathedral Rock. We hugged the creek most of the way until the trail ended without reaching anything of big importance. 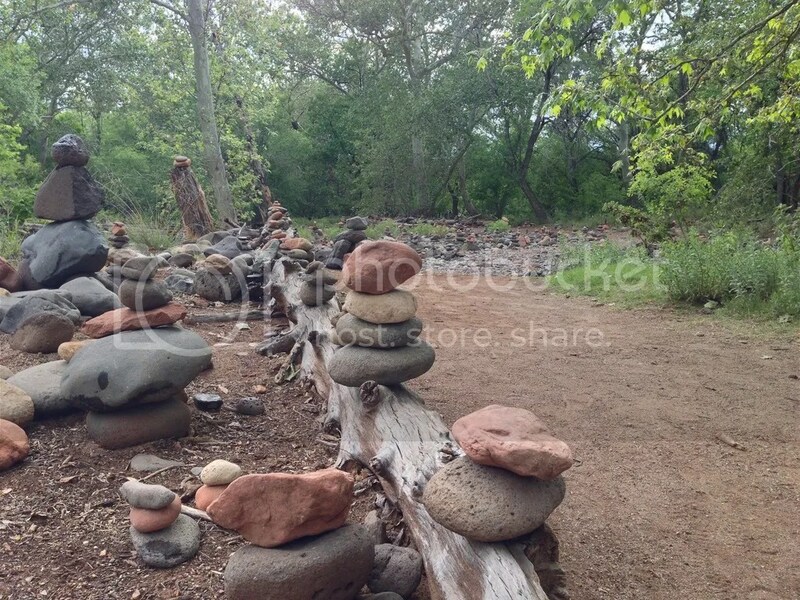 Along the way we saw multitudes of balancing rocks. The place was covered in them. Everywhere you looked and walked you were surrounded. They were on the ground, on rocks, in trees, in posts. It was crazy. 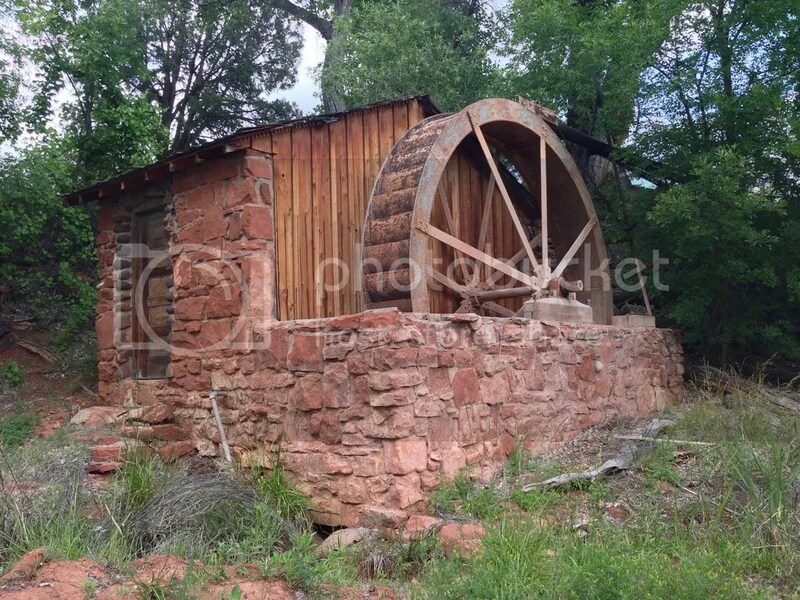 We also stumbled upon an old water wheel and a few waterholes that looked perfect for fishing. We even came across a field that we walked through a bit and connects back to the trail. The fun didn’t actually start though until we waded through the water and played on the rocks that have been carved by the creek. 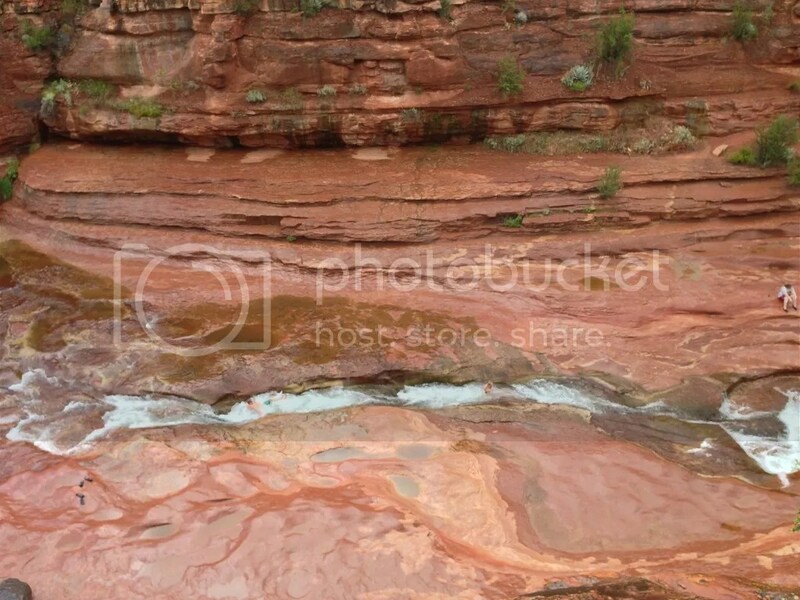 The rocks are a bit slippery so be careful and the water was a bit chilly. However, no one seemed to care too much. 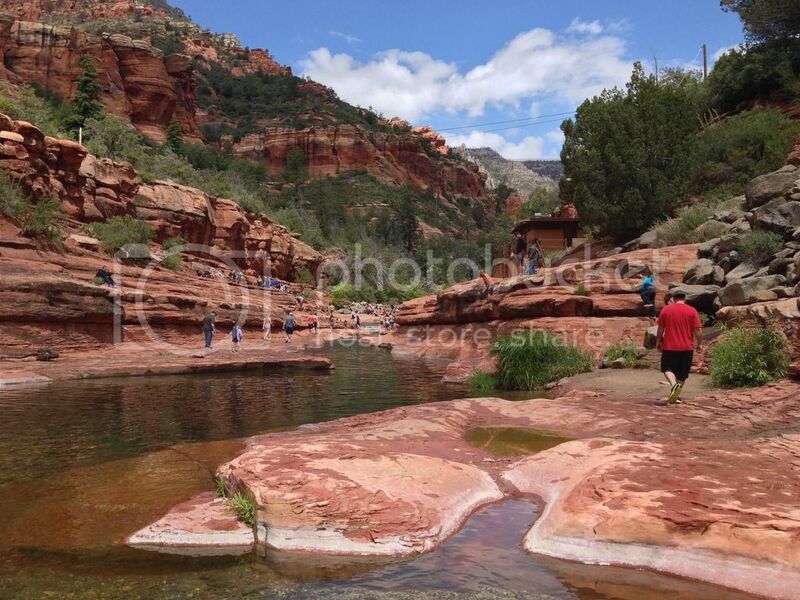 There were people swimming, fishing, exploring and having a great time. We even saw some tadpoles in the crevasses of the rocks we were walking along so keep your eyes peeled. 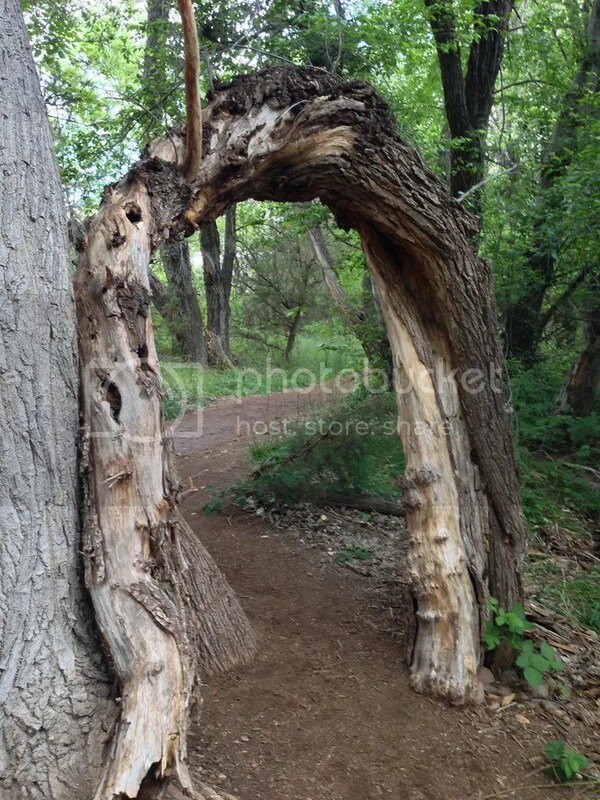 This hike is great for all ages and very easy. It rained on and off the whole time we were there which made it a bit muddy but the trees helped shelter us so we didn’t get too wet. I would try to pick a day that isn’t raining unless you plan on going in the water. You can also make the hike more difficult if you cross the creek or pick some of the trails that run right near the water’s edge. 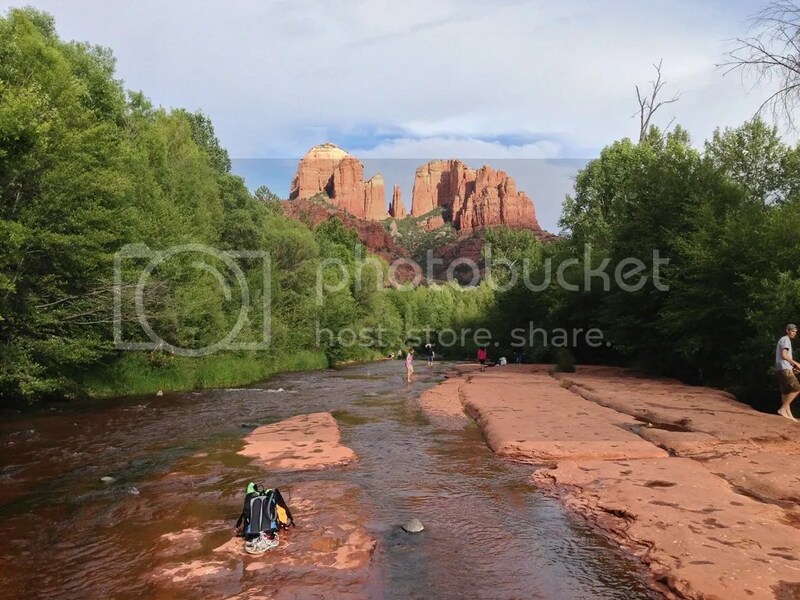 And for the best views of Cathedral Rock be sure to wade out into the water and stand on the red rocks in the center of the creek. 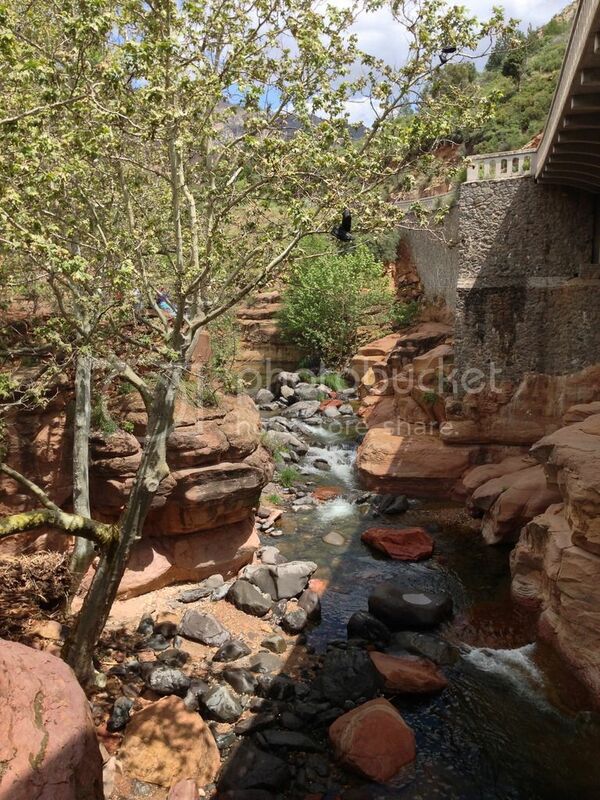 While in Sedona Arizona my friend and I had stopped at the Oak Creek Visitor Center. We were looking for hiking stick medallions for the area, but they didn’t have any at the center. 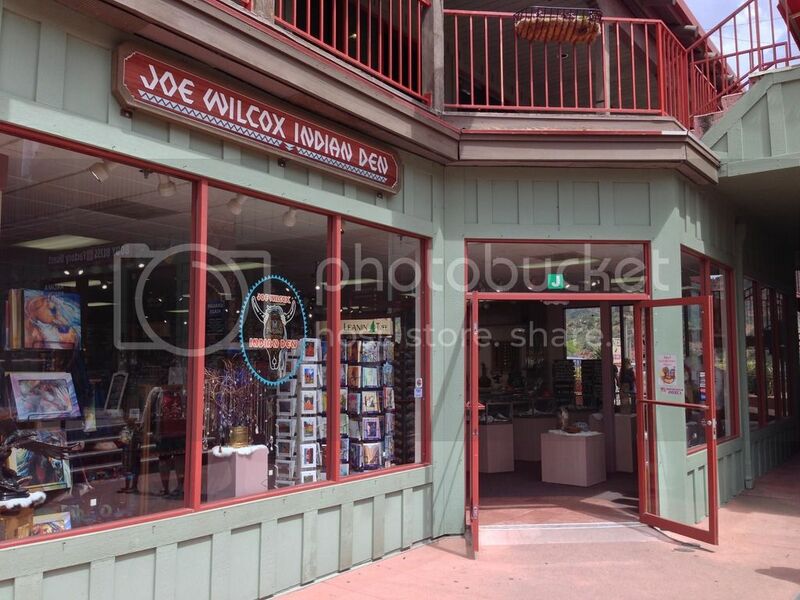 The employee told us to check out the store Joe Wilcox Indian Den in town as they were the only store in the area that she had ever seen them at. We headed into town, just 4 miles down the road, and eventually found the store. 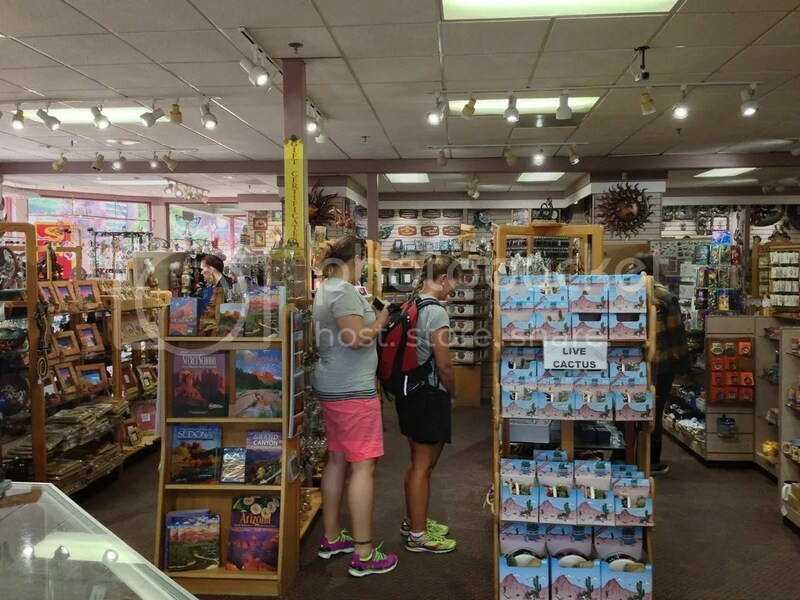 Turns out it’s the biggest souvenir shop in Sedona and has just about everything from hiking stick medallions to souvenirs to desert candy to Native American crafts. The store offers an amazing selection of Indian jewelry, from Navajo, Hopi, and Zuni artists. 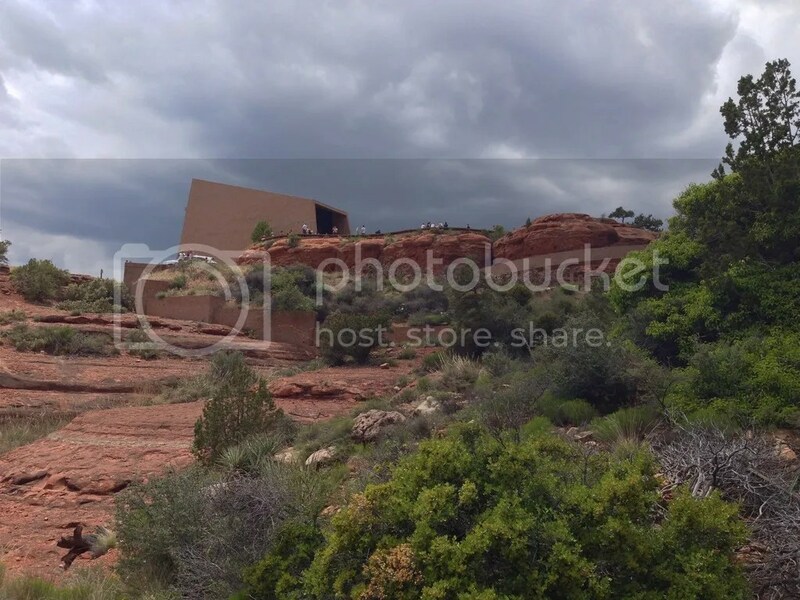 Including many of the Arts and Crafts such as Navajo sand paintings, horse hair pottery, and alabaster carvings and other Indian artifacts. There was so much stuff that it was almost overwhelming. 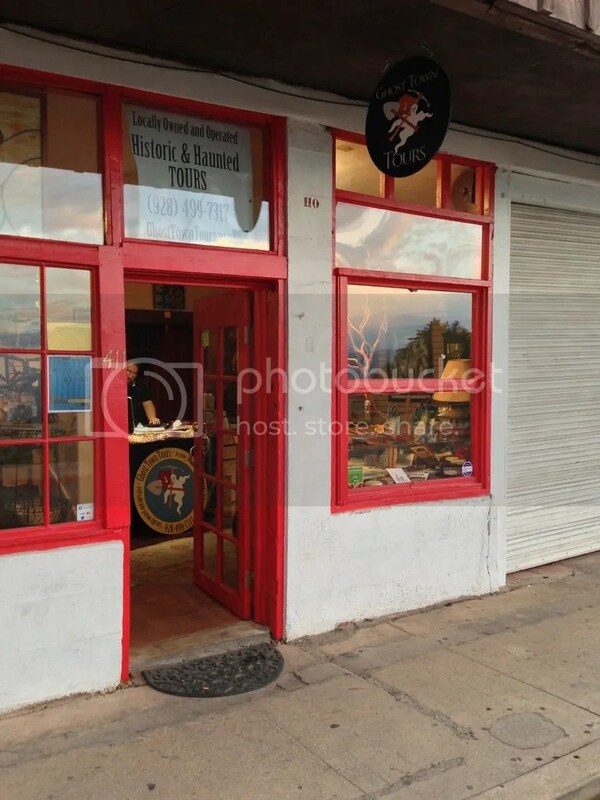 We took some time exploring the store, trying to decide if we wanted anything, browsing the small souvenirs such as magnets, keychains, and small sculptures. We soon noticed the beautiful Native American Arts and Crafts and I thought about purchasing one. Unfortunately it cost a little too much for me and I couldn’t quite figure out how to send it to family and friends without it breaking, since most of my family lives on the East Coast. My friend purchased some candy and we left the store. 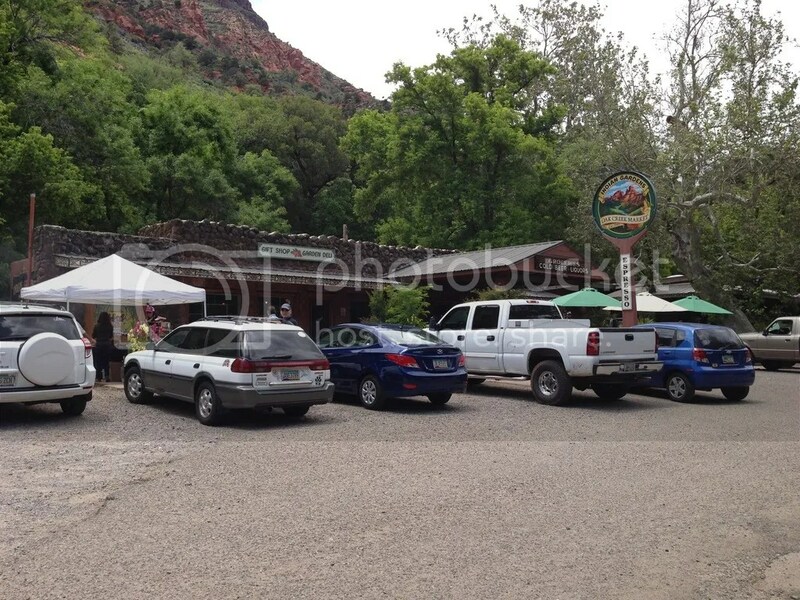 If you are ever in Sedona and need some souvenirs for family and friends this is the place to stop. 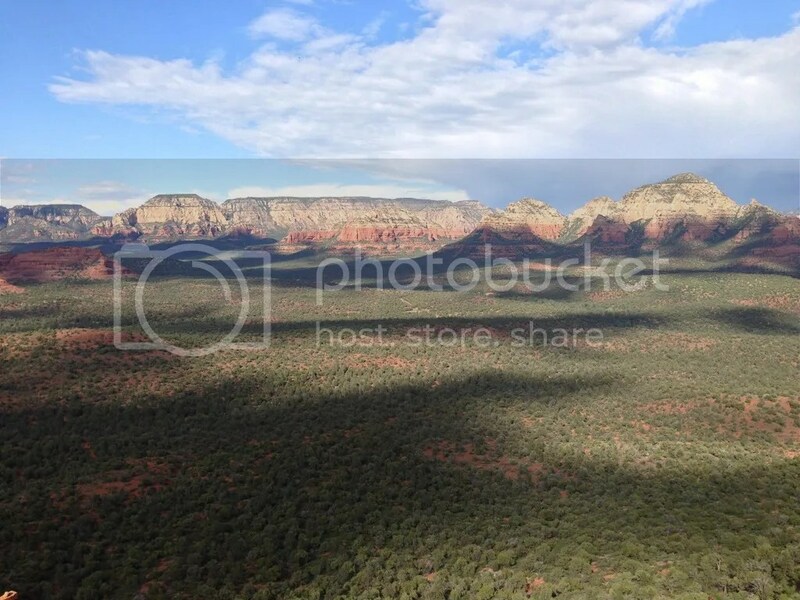 Or maybe you went to Sedona and forgot to get some souvenirs for your family, you can visit their shop online and make purchases without ever leaving your home. You’ll be sure to find something for everyone. 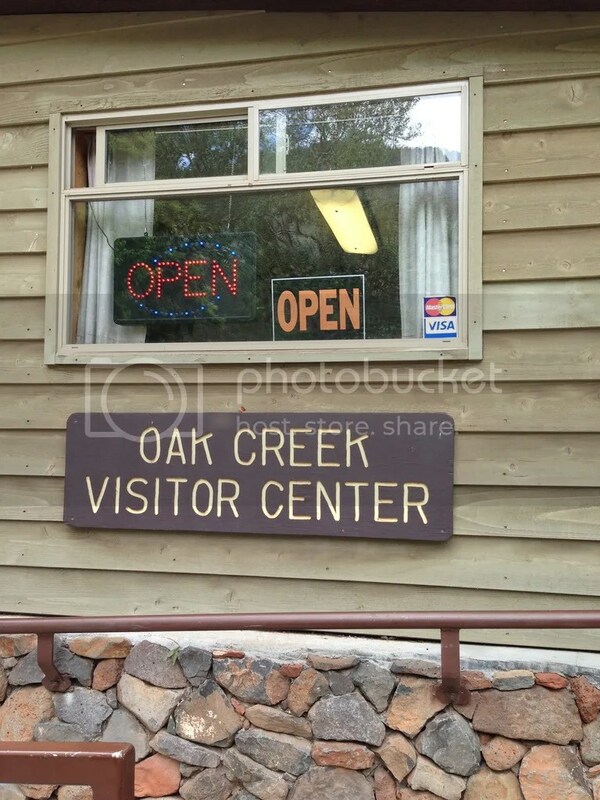 On my friend and my way into Sedona Arizona we stopped at the first visitor center we saw, Oak Creek Visitor Center. 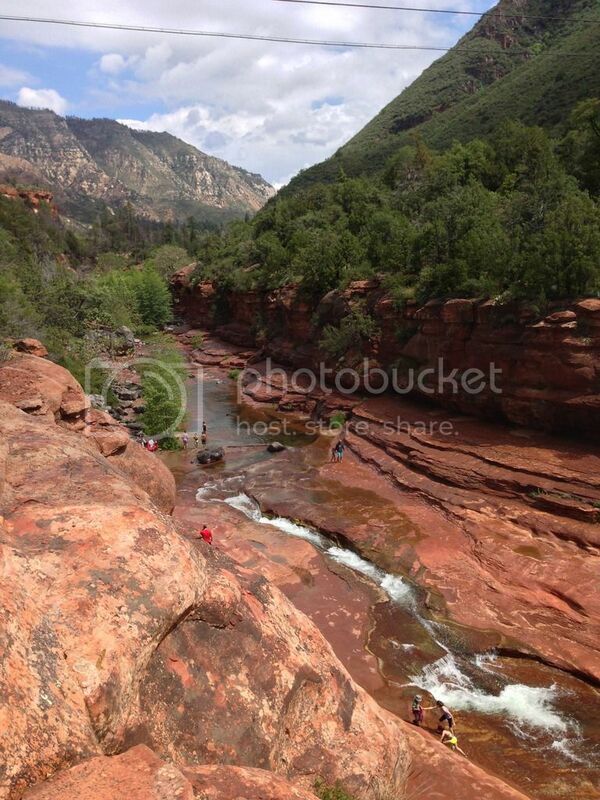 It is located just 4 miles north of Sedona off 89A next to the Indian Gardens Oak Creek Market. We wanted to gather some information and find out about different sights that we might be interested in seeing while we were there. We took a few moments to look around the tiny store about the size of a small bedroom and then went to speak with the employee behind the counter. She was extremely friendly and helpful, I wish I could remember her name. She told us about different hikes we could try, gave us a few maps of the area including one that stretched up to the Grand Canyon, and showed us an amazing book which I ended up purchasing. As we headed out I remembered that right before we turned off the road to pull into the parking lot I had noticed a history marker on the opposite side of the road. I ran back inside to ask her about it and she told me how Indian Gardens was the homesite of the first settler in Oak Creek Canyon. 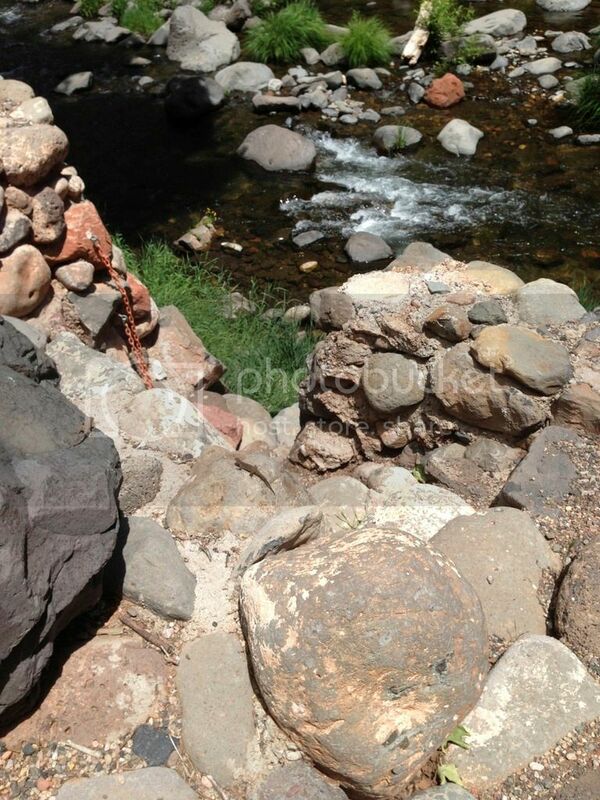 In 1875 scouts from Fort Verde, now Camp Verde, captured a small band of Tonto Apache Indians. The following year, Jim Thompson took “squatter rights” to that piece of land. There he found the Indian’s deserted gardens where the Indians had grown corn and squash and healthy springs. He decided to built a log cabin and named it Indian Gardens Ranch. Since then the name has been changed to Indian Gardens and as the years past Thompson expanded his settlement to include more cabins, a 2-story building, and even a school. 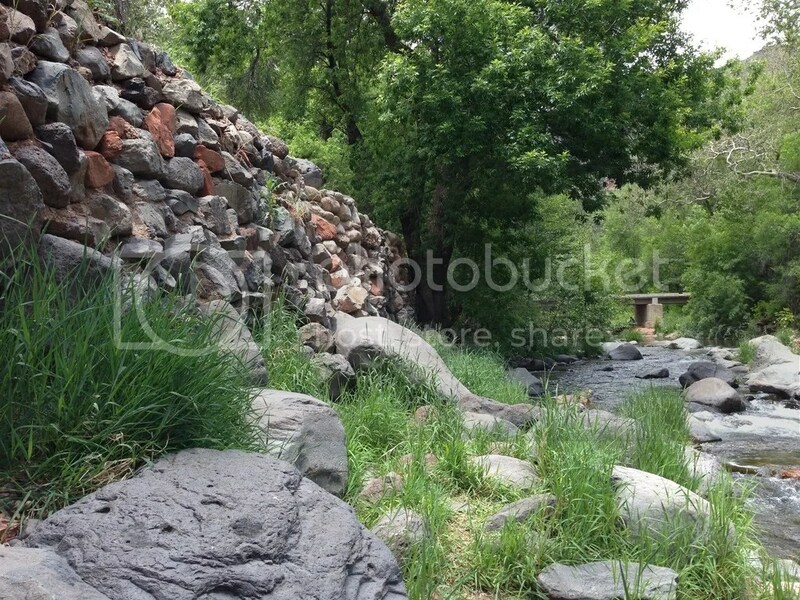 While the none of the structures are there today and development has occurred with new cabins and establishments where the old cabins and school were located, the river and some stone walls are still there. So, while there isn’t really much to see, it’s still nice to learn about the history of a place and be at the original location of where others settled long ago. 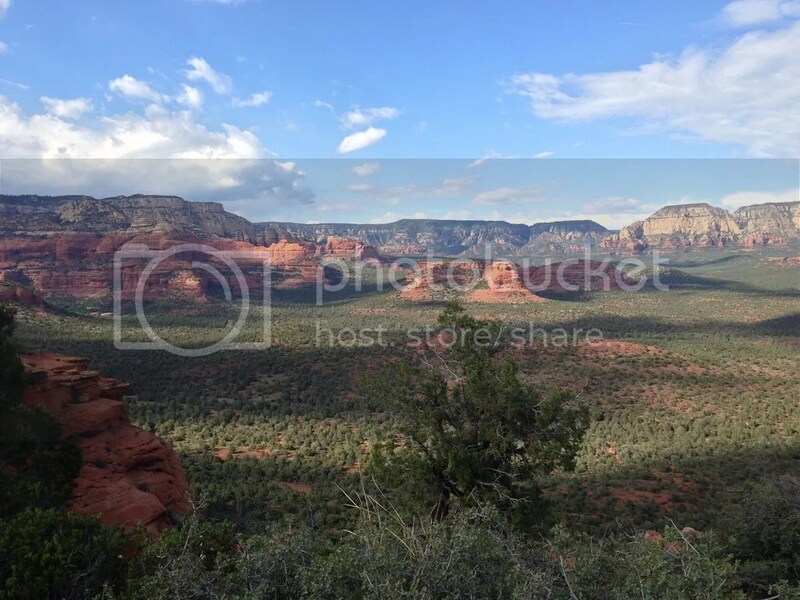 While my friend and I drove down route 89A into Sedona Arizona we went right past a sign that read “Elk Jerky Ahead” and became determined to try some on our trip. We couldn’t seem to figure out where that sign was trying to lead us to. Maybe the little house nearby, but it didn’t look like a store so we decided to look elsewhere. 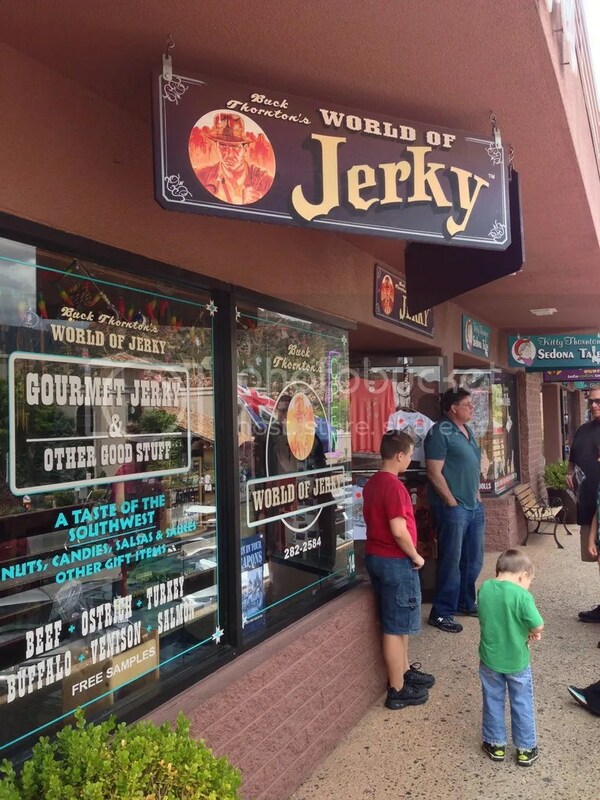 As we arrived at Sedona, we drove down the main road where I noticed the Buck Thornton’s World of Jerky on the second story of a little shopping area. I shouted to my friend excitedly and she quickly found a small parking lot to stop in. We got out of the car, crossed the street and headed up the stairs. Inside the store was jerky everywhere as well as nuts, candies, salsas and sauces. The store was full from the ceiling to the floor. There were so many different kinds I can’t even remember them all. A few I do remember were elk, venison, beef, buffalo, alligator, kangaroo, and ostrich. 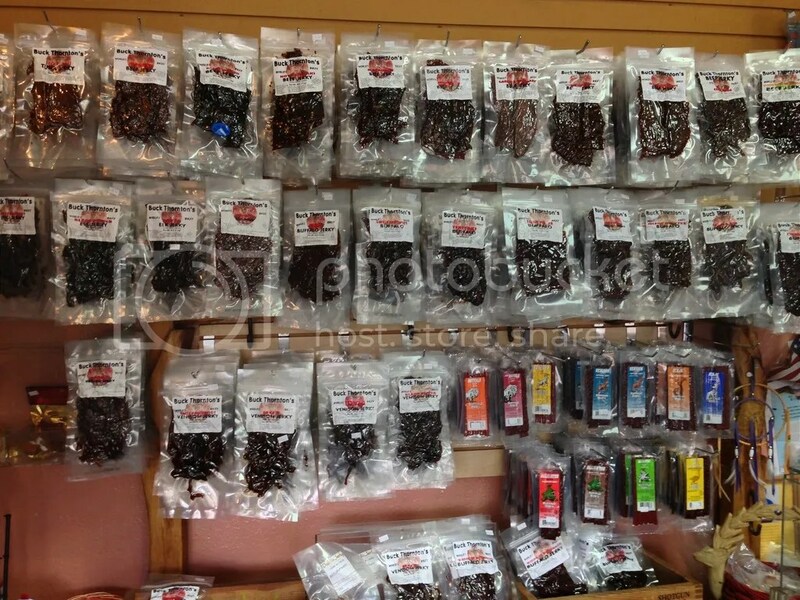 They had variety packs where you could purchase a number of different flavors and just single flavor bags. 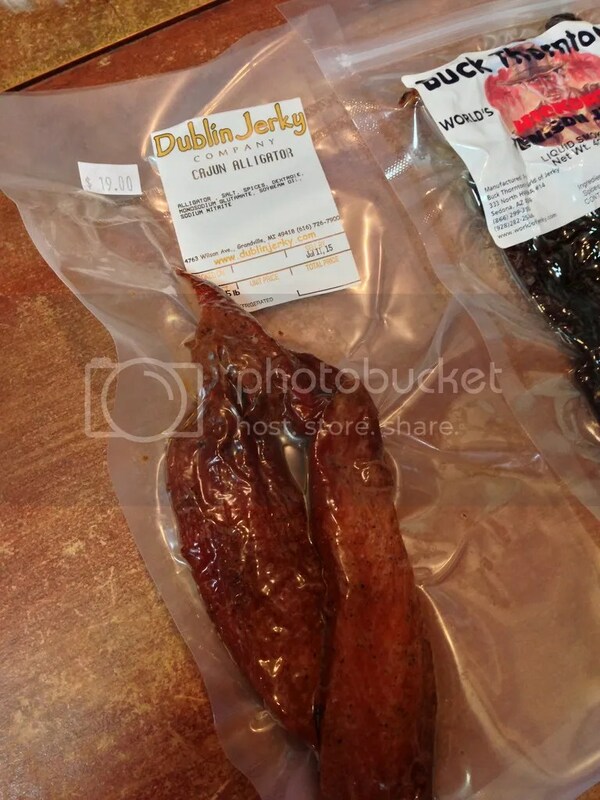 We stood at the front desk and overheard Kitty, the “Queen of Jerky” and co-founder, ask another customer if they would be interested in trying any samples. The customer replied no, but my friend and I jumped on the chance. We tried a little bit of everything and they were all so delicious we had a hard time deciding on which to buy. We finally settled on alligator, ostrich, and venison, both very pleased at our selection. 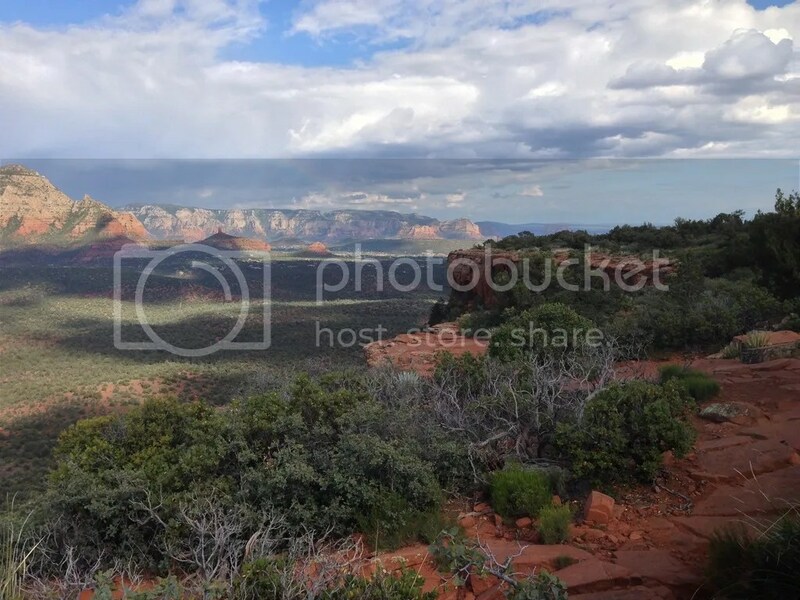 We continued to talk to Kitty and she told us about some amazing hikes to go see in the area, but we decided to stick to the one we had already planned on checking out. 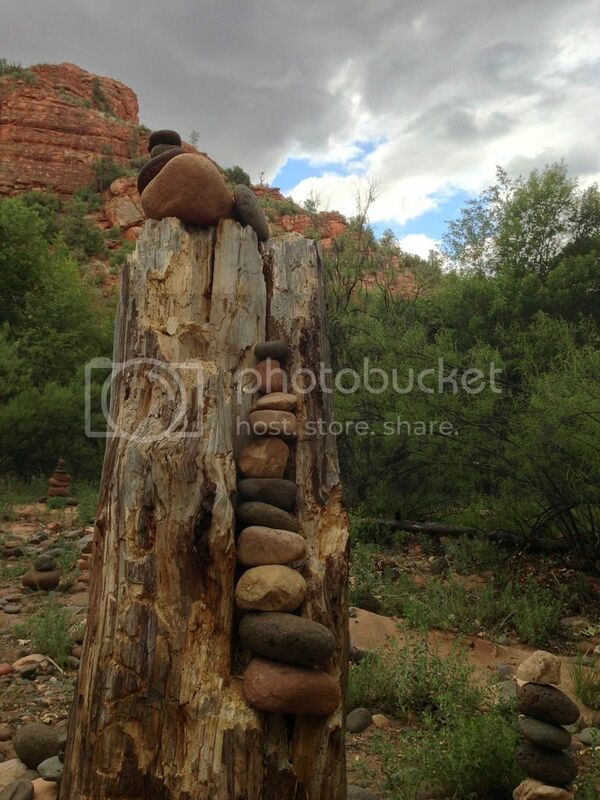 She also gave me a beautiful magnet for Sedona that I had been planning on purchasing. 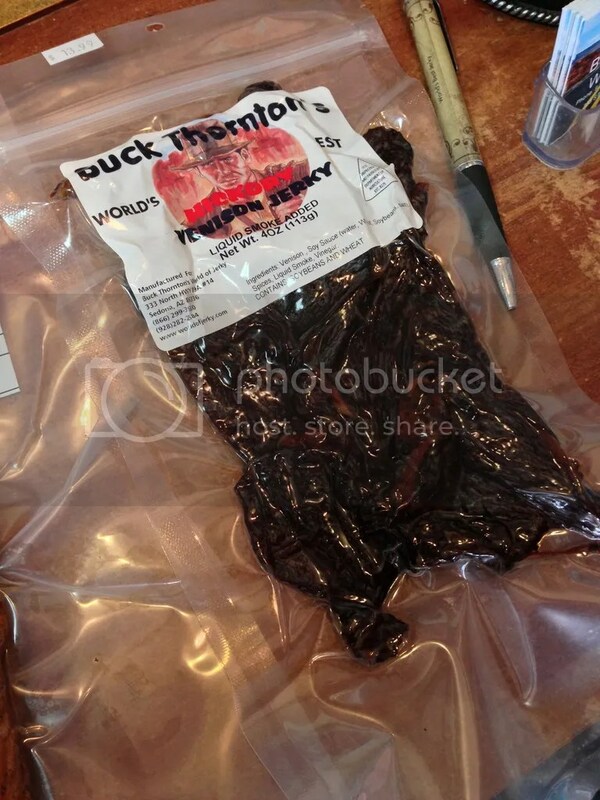 If you like jerky at all, Buck Thornton’s World of Jerky is definitely the place to venture to while in Sedona. With enough hospitality, generosity and kindness to win the heart of anyone that walks into the shop, you won’t find another place quite like it. And if you can’t get to their store, you can always order from their online shop! 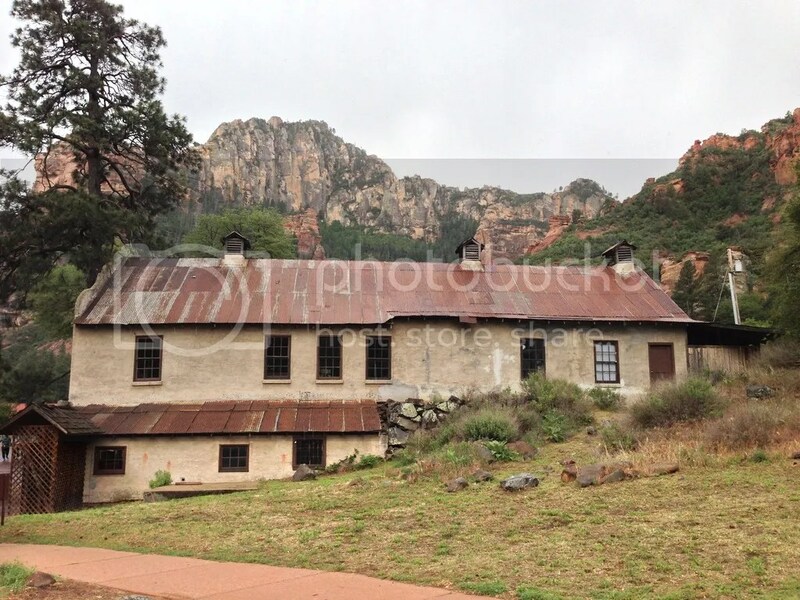 About 45 minutes west of Sedona is the largest Ghost Town in America, Jerome. 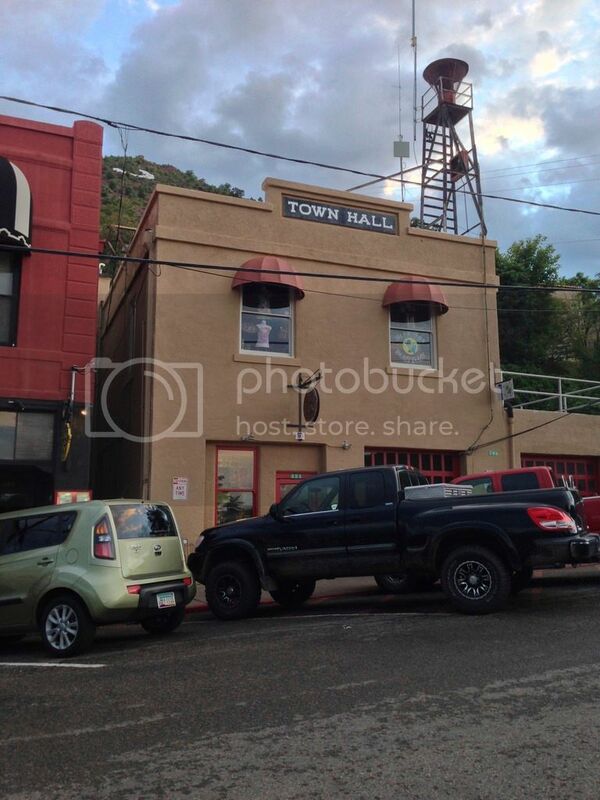 With a population of only 450 people now and over 15,000 at it’s peak in the 1920’s, it was a copper mining community sitting above the largest copper mine in Arizona and one of the fourth largest cities in the Arizona Territory also known as the wickedest town in the west. Between 1894 and 1899 it suffered four disastrous fires destroying large sections of the town. Much of what you see there today has been rebuilt and restored since then and more buildings are planned for restoration. 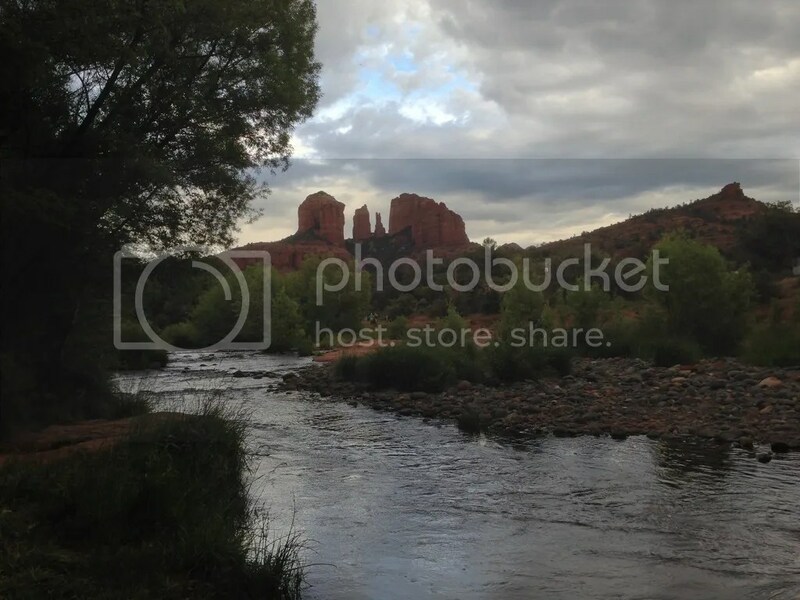 While in Sedona, my friend and I realized that there really isn’t much to do at night time. 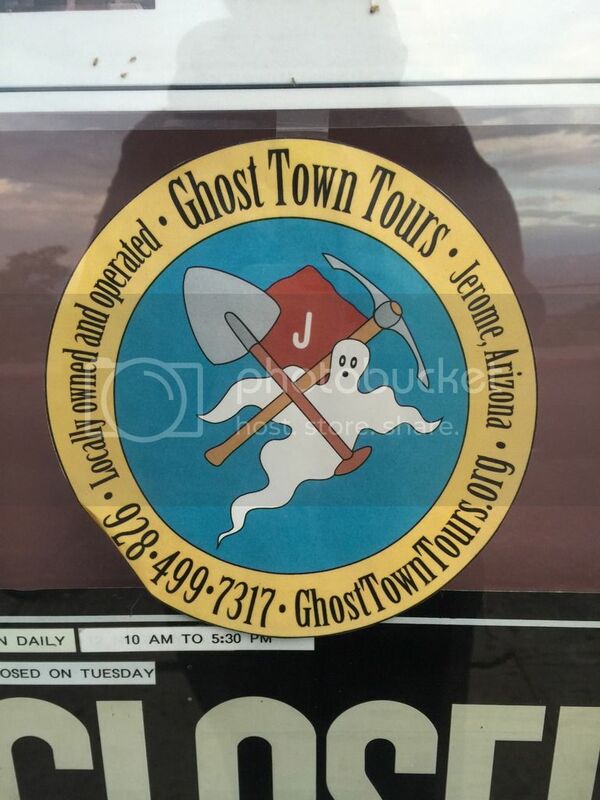 I had noticed a groupon for Haunted Ghost Tours in Jerome and since we were so close we decided to drive over and check it out. We found one of the few places that do it and signed up for a tour at 8:00pm. 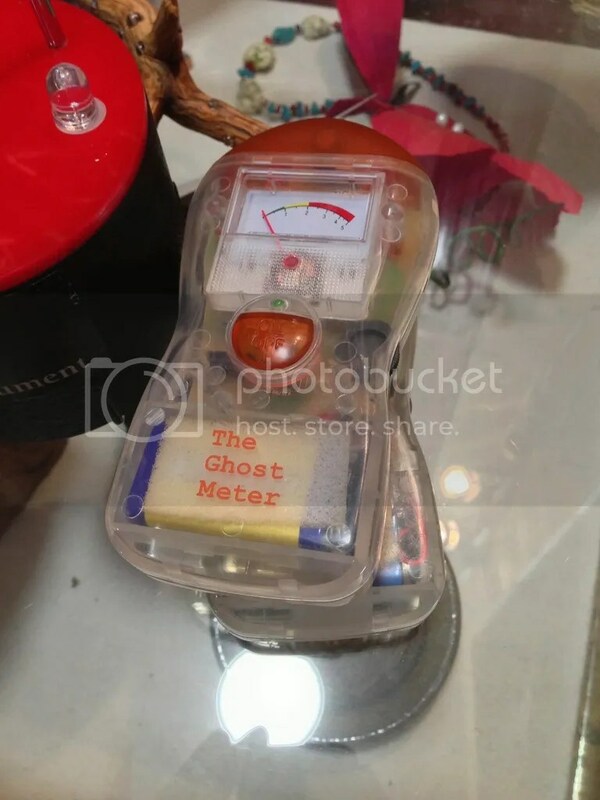 We made a quick detour to get dinner at a local restaurant, Grapes, and then headed to Ghost Town Tours to meet up with our guide, Scott, received our EMF “Ghost Meters,”and to get started on our tour. Our tour consisted of my friend and I and a small family with 3 children ages 6 to 15. They seemed just as excited to get started as we did. 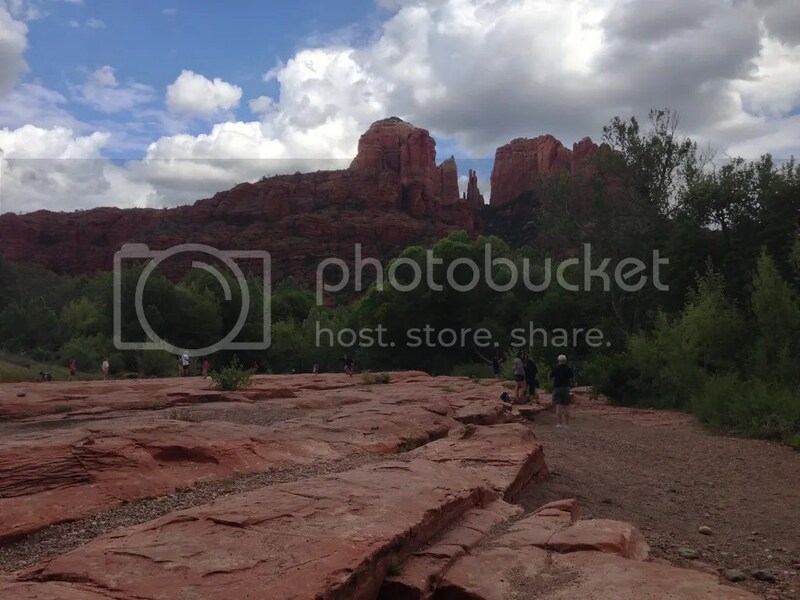 We turned our phones to airplane mode, readied our cameras, and headed out to our first stop right outside the store. 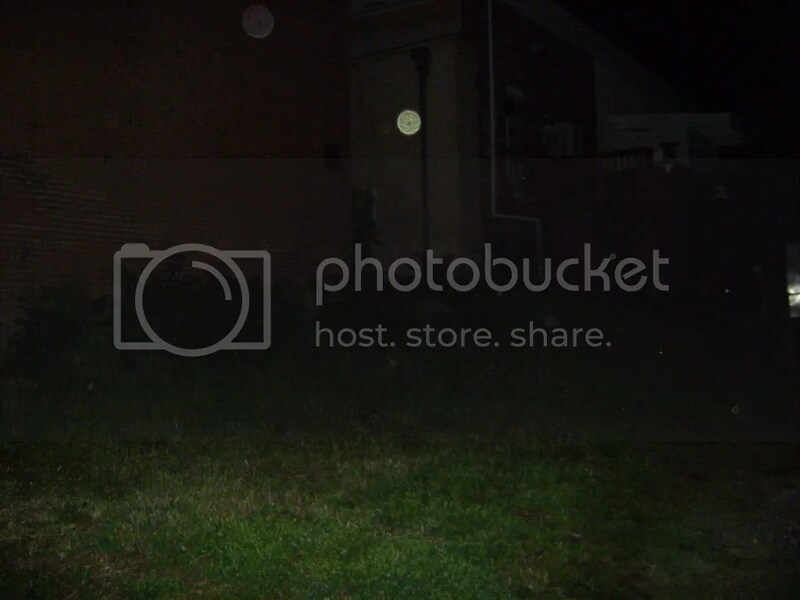 I can’t remember the story, but I took my first picture and after looking at it later that night realized that it was the first picture with orbs in it. 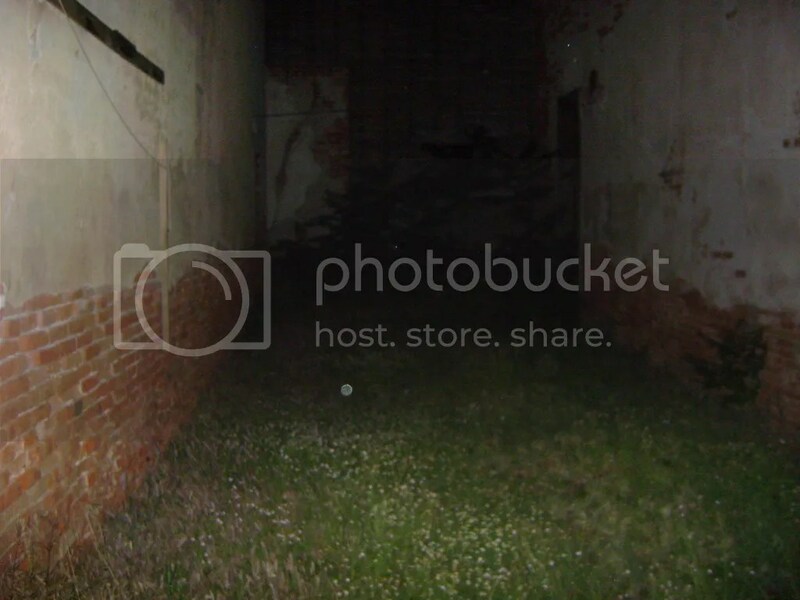 Wow, orbs in the first picture! Amazing! We walked the short trek to the original town jail that has been sliding down the mountain and used to be located about 4 streets up. This is where we were told the first story I actually remember. A cute love story about a boy and girl from different walks of life. There are often sightings of the boy through the jail window as there was a fire and he didn’t make it out alive. We didn’t see anything or get any readings so we continued through the town. We stopped at the old copper mining machine which was three times the size of the piece of machinery we saw. Scott told us about the town’s records and how many people died but only a few were buried at the graveyard. “Where did the rest of the bodies go?” he asked us. We can only assume that many were burned in the machine and made into the walls of the town. Surprisingly, there has never been a reading at this machinery on any of the tours and we were no different that night. We continued on and the next stop was the theater, where the eagle fell off the building and someone on a trip was pushed down the stairs. 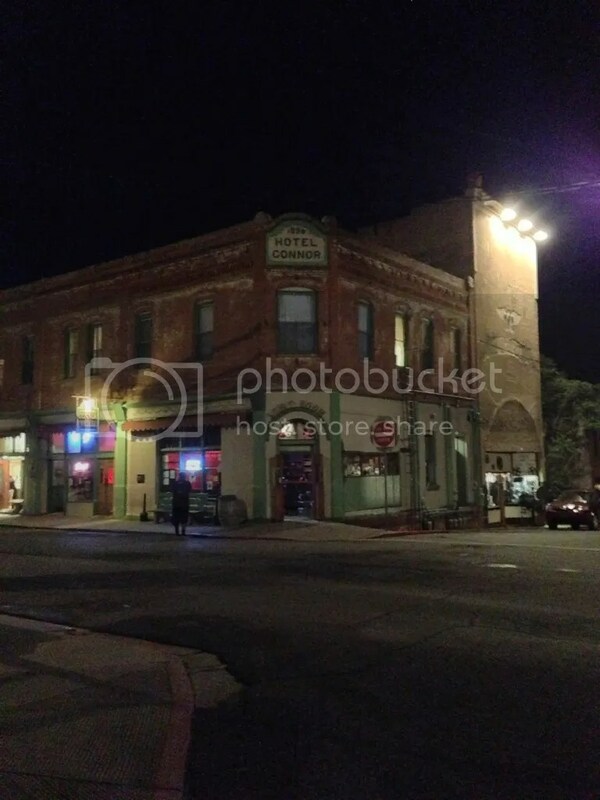 Next to that is the Hotel Conner that had two fires neither which killed Mr. Conner and where men say that they feel uneasy staying in the room closest to the theater. We still didn’t get any readings so we continued on. We headed to the church where Scott lives and on the way he told us about the three hospitals in town. Since medical care back then was not what we have today, when people got hurt in the mines and it was serious without any hope of healing, the person would get 10 days to live and say goodbye to their family. It was the least the town could do to honor them and their time spent working in the mines. Today, it is said that after sundown within the hospital halls screams and moans of pain can be heard. Carts are still pushed down the corridors with doors opening and closing. There is so spiritual activity it is too much for any grown man to handle and stay the night. We arrived at the church, but didn’t get any readings outside. We went inside and Scott told us about the priest that still walks the halls and how he doesn’t like it when people visit. 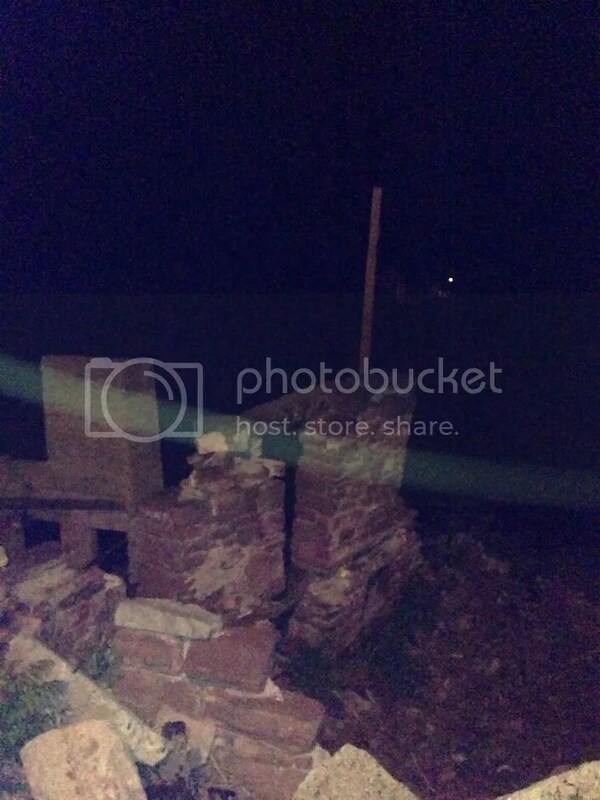 Still no readings so we headed out to the back where psychics have said that there is a body buried, but no readings. Sometimes they didn’t have or couldn’t afford headstones so they would plant trees instead. We continued on and Scott seemed kind of stumped. This was the first tour that he had gotten this far and hadn’t gotten a single reading along the way. We stopped again and he talked about the saloon fire. I suggested that we go over and check it out. He agreed and we headed that way. Something had drawn me to it earlier that evening and I was hoping there was something still there. We came to the front, but no readings. One of the kids started beeping and it was just the electrical meter, but as we walked away and held our meters we started beeping. It was crazy. 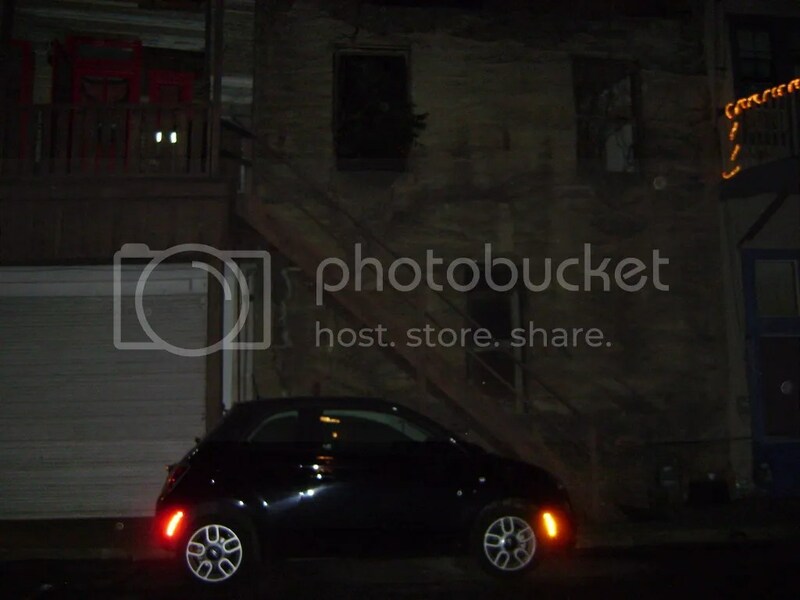 Soon we were beeping everywhere, high, low, left, right, even out near the street away from the building. My hunch had paid off and Scott seemed super surprised. He had never heard of anyone receiving any readings there. Maybe hearing some cries of a woman looking for her child or a baby crying, but never any readings. We had found something new. 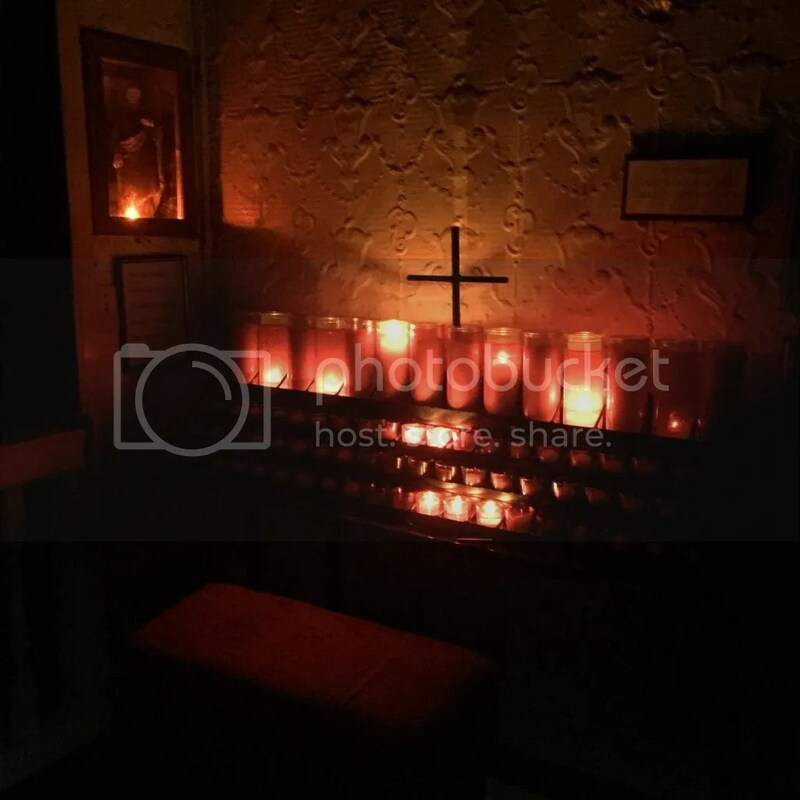 I took multiple pictures all around the area and into the saloon and found orbs in many of them. The one at the backside of the building had the most. It was insane how much activity was there. We continued to the edge of the town where the mexicans lived further down the mountain. Jerome was very segregated and the white people didn’t even count the mexican or blacks into their town population so who really knows how many people lived there. We got a few readings at this corner as they are in the process of restoring some of the buildings. We finished our tour through the “Cribs District” in a back alley where all the buildings were are part of Jerome’s ill-famed “prostitution row.” With both brothels and bordellos were in this area and there was lots of fighting. The police officers were often just hired help to make sure things didn’t get out of hand. We didn’t get any readings here, but did hear another story about one of the bordello’s window girls dating both the mayor’s son and chief of police’s son. I won’t give away how that ended, but you can probably guess. 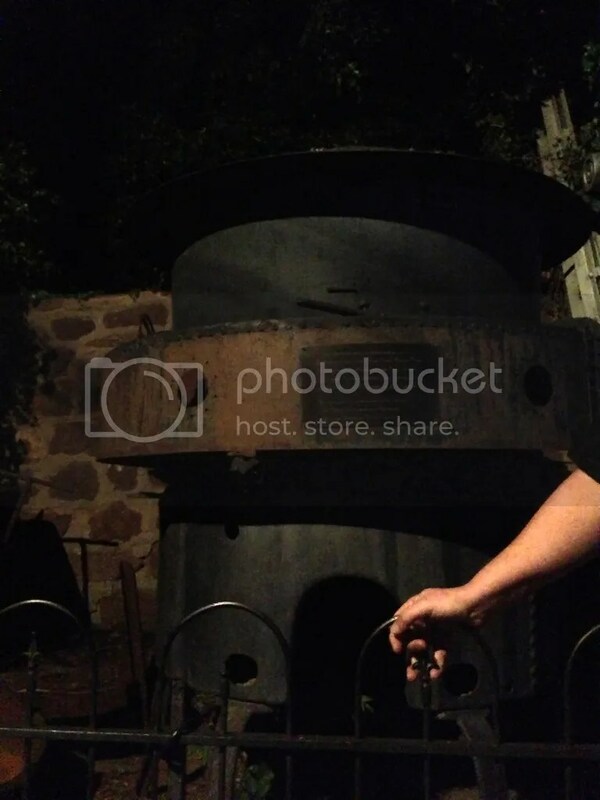 The Ghost Adventure Tour was so much fun. I would recommend everyone checking it out. There’s so much history in this little town and I plan on going back for sure. I know Halloween is far away, but if you plan on checking out this town as an additional Halloween scare this year you would be best to do it soon as haunted hotel rooms are booking up and ghost tours are close to being full already.